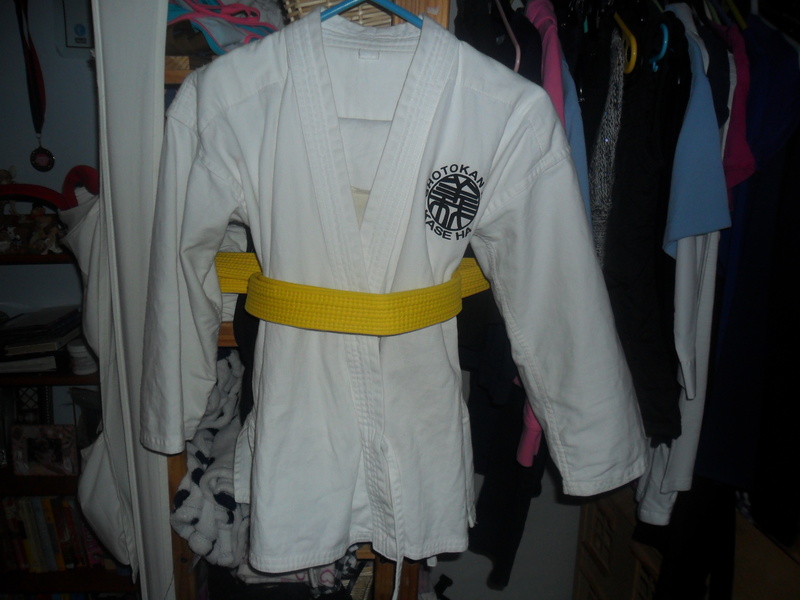 I thought I’d start by saying a big ‘Well Done’ to my two daughters, as they both passed their Karate grading this weekend and they are now proud owners of ‘Yellow Belts’. This is the third belt they have acheived so far. This time last year we thought my eldest daughter wouldn’t be doing Karate again, as her asthma was so bad, so we are very very proud of them. Some of you will already know, that all of last week I was painting our hall and landing. 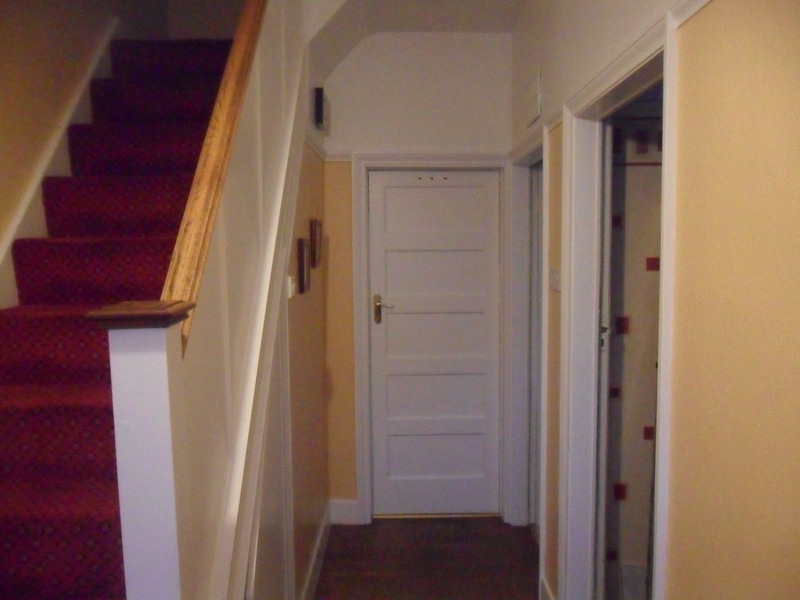 I finally finished painting the downstairs yesterday, though I do still have the woodwork upstairs to finish. We had two sets of wall mounted coat rails on our wall before I started painting, but both of them had a couple of hooks that had broken. I decided to take the rails off the wall and throw them away and buy another two. I visited B&Q and Wilkinsons to buy them, but I was surprised to find that the cheapest were £16 each! 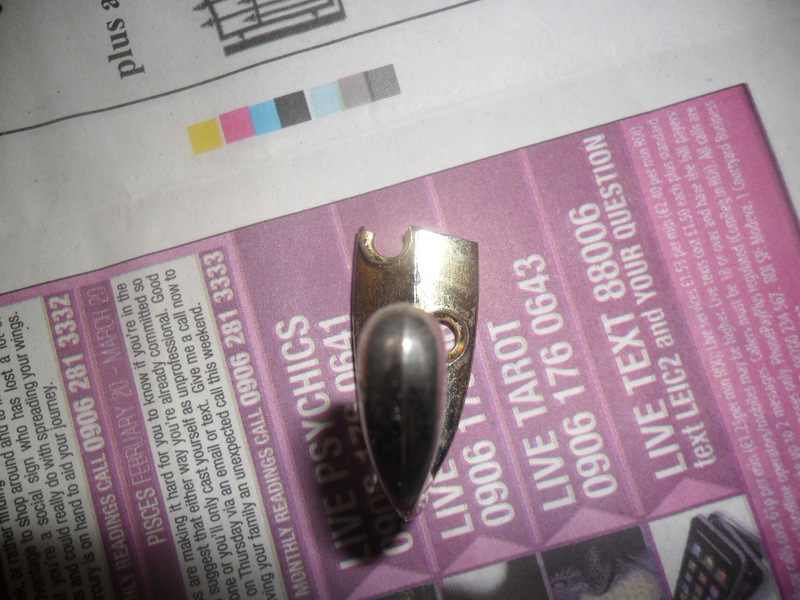 I decided to look around and I found four new hooks, exactly the same as the ones that had broken, for just £4.96. 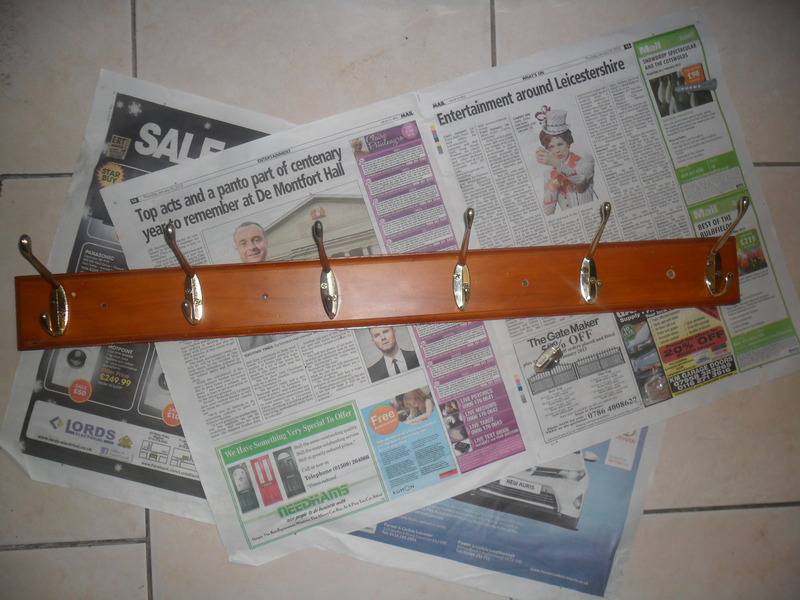 I then pulled the old coat rails out of the wheelie bin and gave them a good clean and Mr Thrift replaced the broken hooks with the new ones. We are very pleased, as this saved us £27.04 for both rails, just by spending five minutes extra repairing them. Over the weekend, I visited the British Heart Foundation charity shop in Leicester. It is a wonderful shop with lots of furniture, TV’s, washing machines etc. It was fascinating to walk round. They have a good electrical section and I spotted an ice cream maker, which was in really good condition. It looked as though it had hardly been used. Last year, I borrowed my sisters ice cream maker to try it out and it was a great success. I have been looking for a good ice cream maker to come up on EBay for months, but the ones that I have found usually have a smaller bowl. This one is a 1.45 litre capacity which is much better for a family. As you can see in the picture, it is in good condition, with the original manual and it has a book to go with it. The box is a bit battered, I suspect it was one of those appliances that ended up at the bottom of a cupboard and was hardly ever used. But for me it will be great. They charged me just £10 for the ice cream maker and they even gave me a six month warranty on the appliance, because it is an electrical item….I don’t think I could do better than that! It will be so useful as I can now start to make dairy free chocolate ice cream for my youngest daughter and this should save me pounds if I can find a good recipe. If you know a good dairy free chocolate ice cream recipe, please let me know. I am hoping to finish my painting in the next few days, so hopefully then I can get back to normality again and catch up with things that have got behind, like my batch baking and my allotment planning. All being well, I’ll be back on Friday evening. 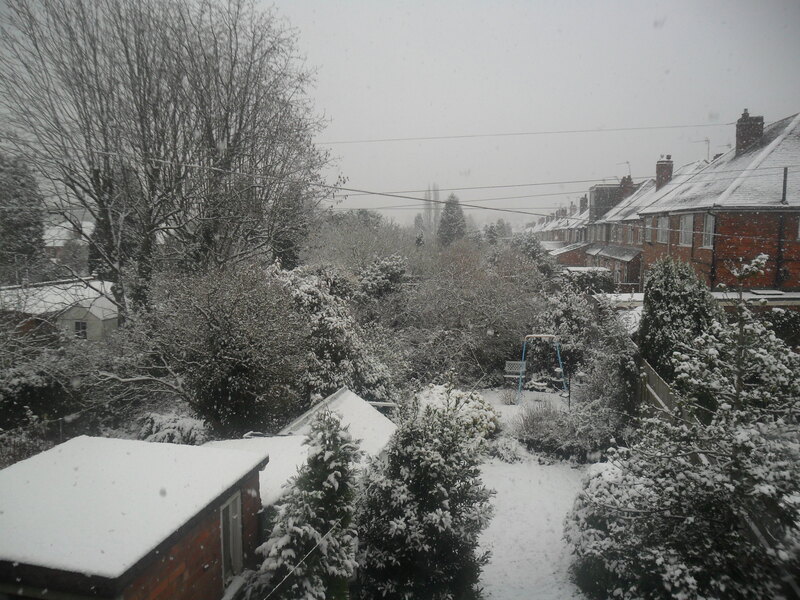 The snow has been beautiful to look at this week and it’s been so much fun for children, even though it has caused a lot of traffic disruption. Both my daughters’ schools were closed on Monday, so it was lovely to have them around. I took my youngest daughter sledging and I’ve got to say we had a wonderful time. My girls also built a snow man in the garden and they had a snowball fight with their dad, so they really took advantage of the heavy snow. 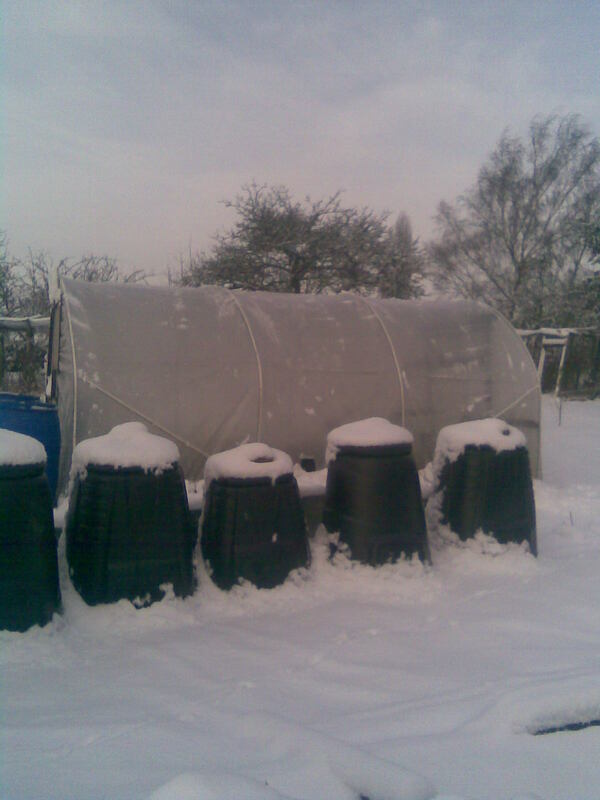 On Monday, I was worried about the heavy snow affecting my polytunnel at my allotment, so I went to check it. There really was a lot of snow on it, so I knocked it all off with my brush. 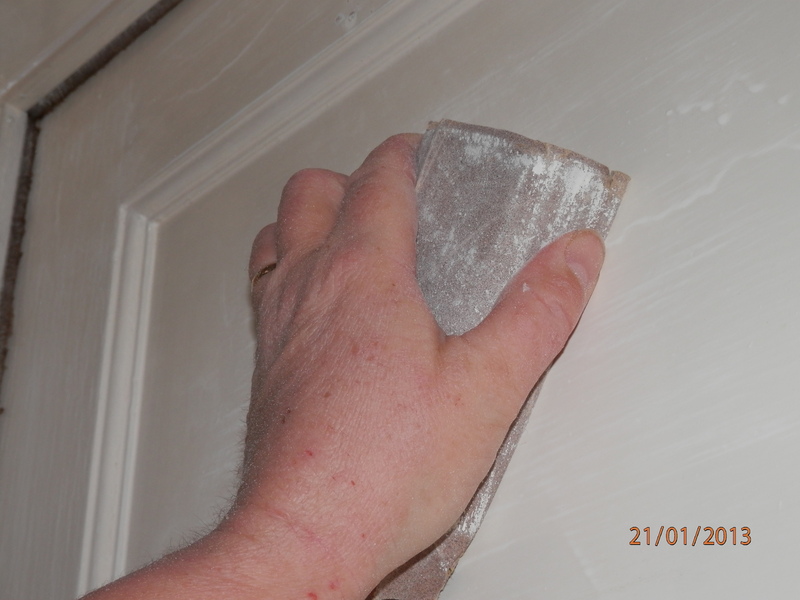 Unfortunately, it had done a bit of damage, as the plastic was beginning to pull away from the door frame. I will have to fix this on a dry day. 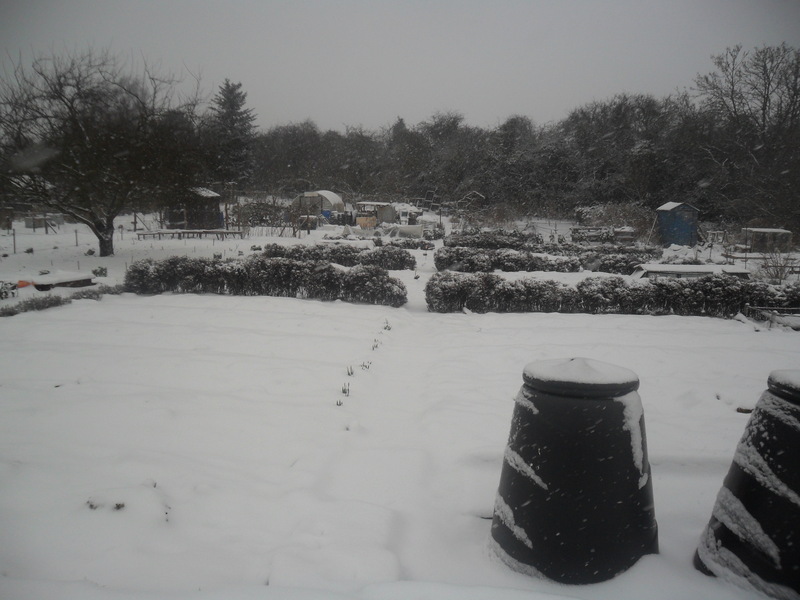 My allotment visit was at 3.30pm, which was fine to get into the gate at the allotment site, but unfortunately by the time I left, the locks on both the allotment gates had frozen up as the temperature must have dropped. I must admit I was beginning to panic a bit, having visions of being stuck all night in a cold dark allotment, but luckily someone came out of a house next to the gate so I was able to shout him. He poured hot water over the lock and at last I was free! 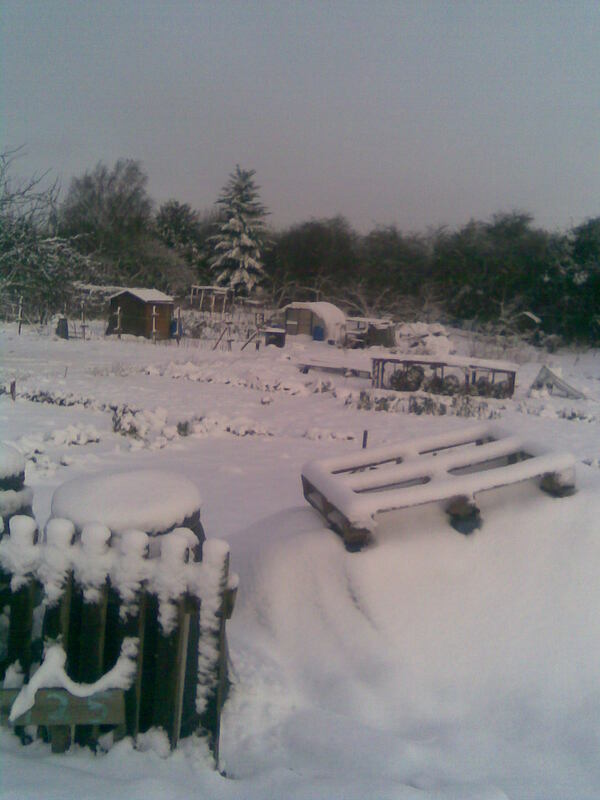 I certainly won’t be going to my allotment in the snow at that time of day again! Remember the nineteen packets of unopened seeds I put on EBay…well I managed to sell them for £8.44, plus postage. I know it isn’t loads of money but ‘every little helps’ as Tesco says in it’s well know advert. My seedlings are doing well on my window sill. 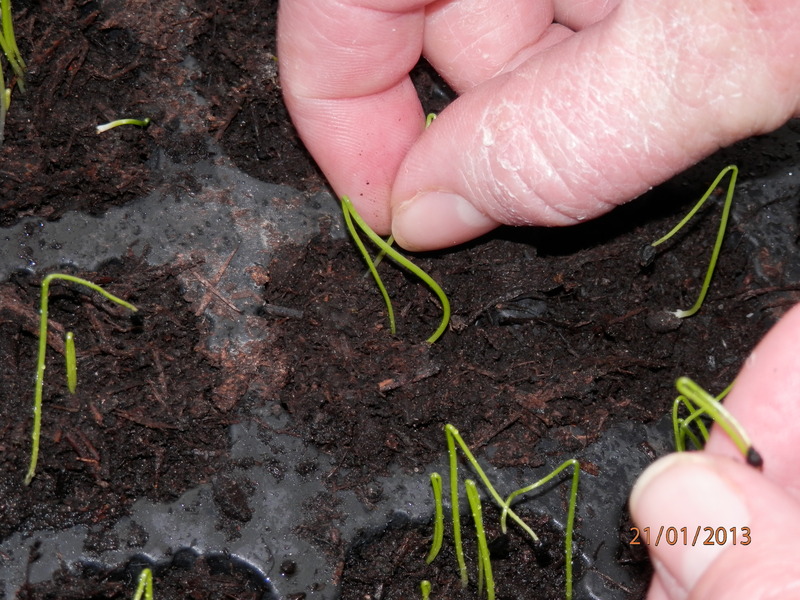 The coriander is looking a bit ‘leggy’, due to the low light level and the seedlings lean towards the light. I take all of my seedlings off the window sill at night (so they don’t get too cold) and turn them around the next day, when I put them back on again. To help with the light, I have covered some old cardboard in foil and put it at the back of all of my seedlings, this will allow the light to reflect back onto them, to stop them leaning so much. 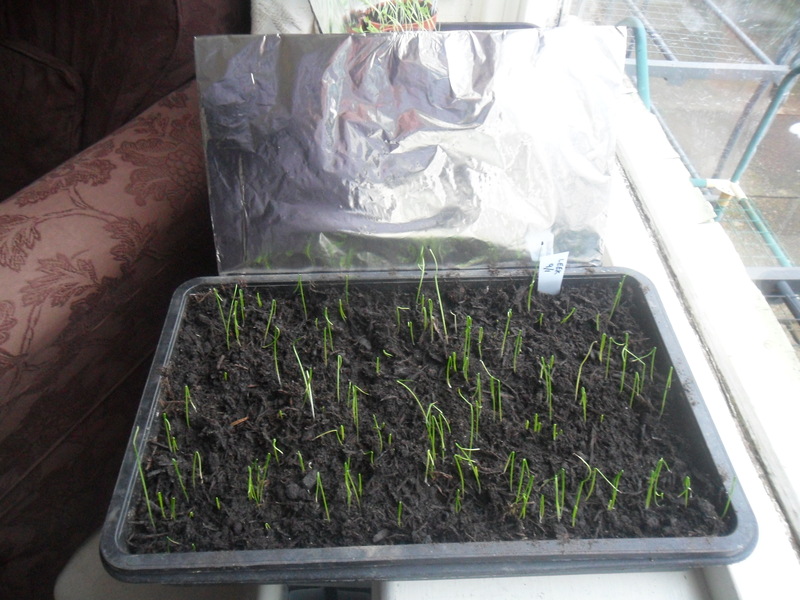 My leeks are coming up nicely too. 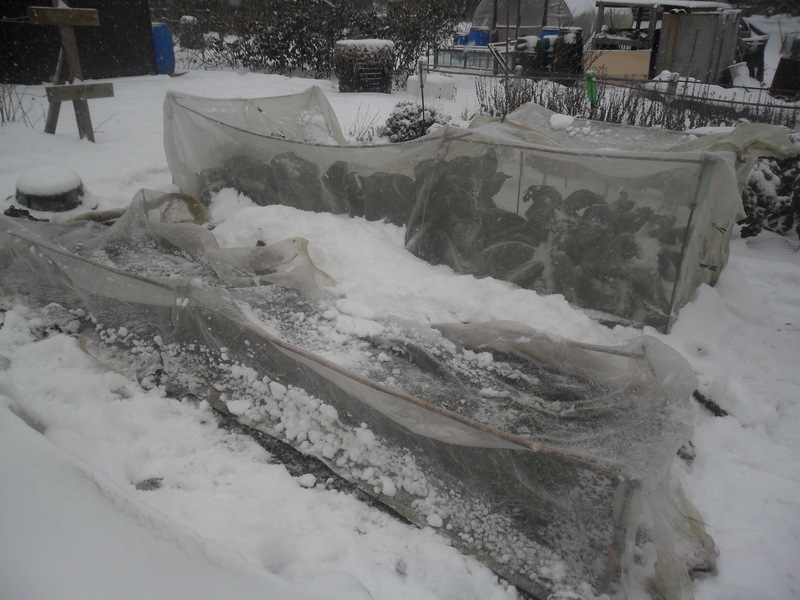 I had wanted to move them quite quickly into my cold greenhouse, but the temperatures have been so low, even in the day time, that I haven’t been able to do this yet. This means I will have to ‘harden them off’ first (which means gradually leaving them outside for a longer period each day, so it’s not such a shock for the plants). I will wait until the weather warms up a little in the day time. My onions are also doing well. 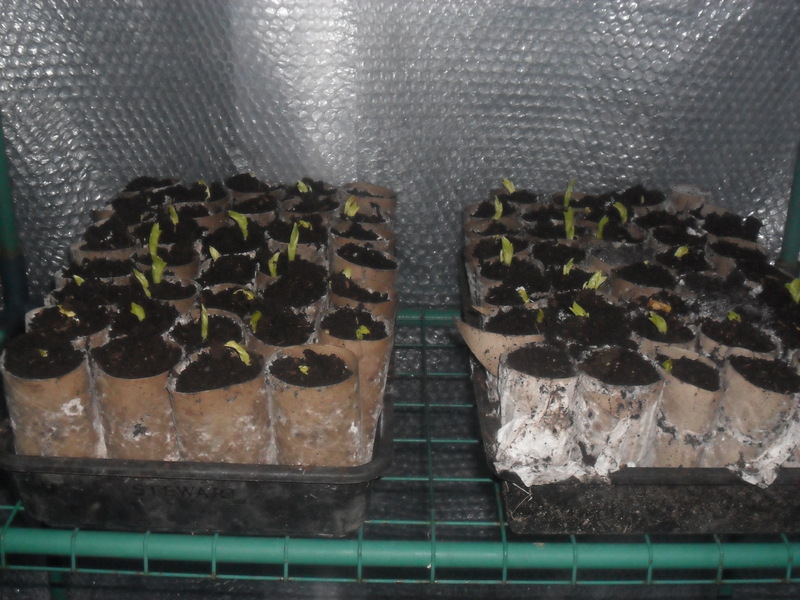 I used a pinch of seed in each individual module and they have germinated. I then ‘thinned them out’ so there is now just one onion in each module. The onions will stay on my window sill for quite some time now. 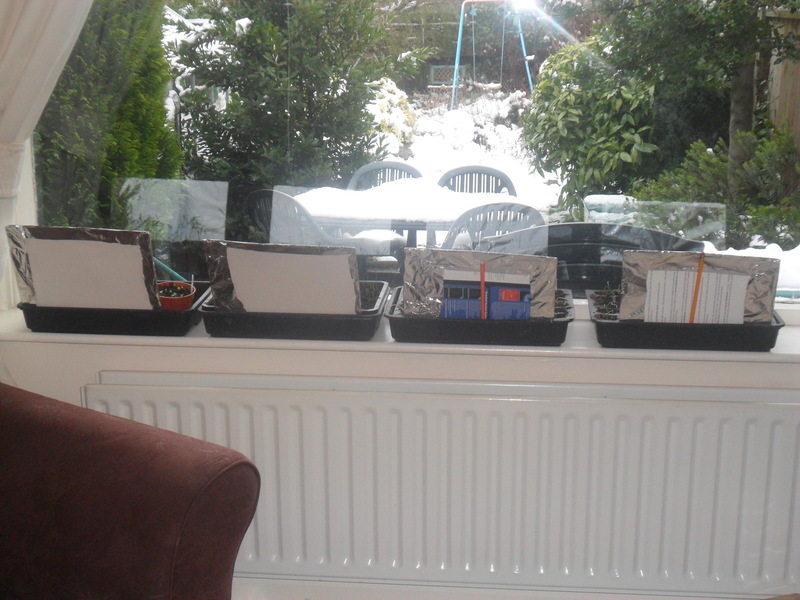 I do have an electric greenhouse heater, but it does cost quite a lot to run, so I use my window sills until they are at bursting point. 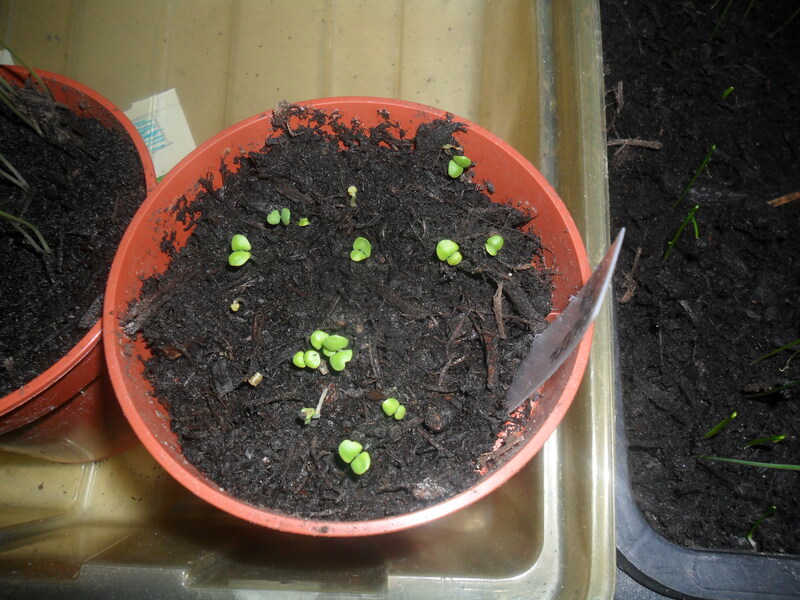 Finally, my basil is also peeping through now, but my peppers are still in my propagator with no sign of germination. 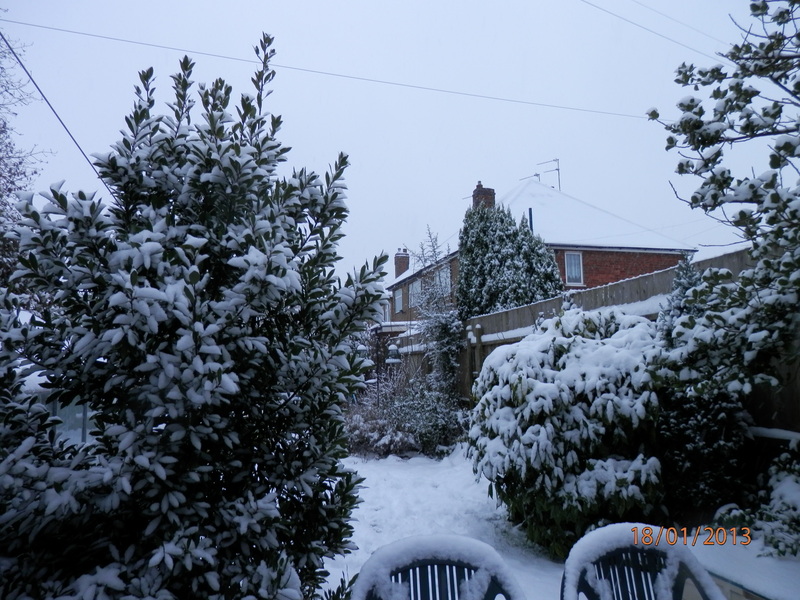 As it has been so cold and a thick layer of snow has covered everything outside, I haven’t been able to get to my allotment to actually do anything. 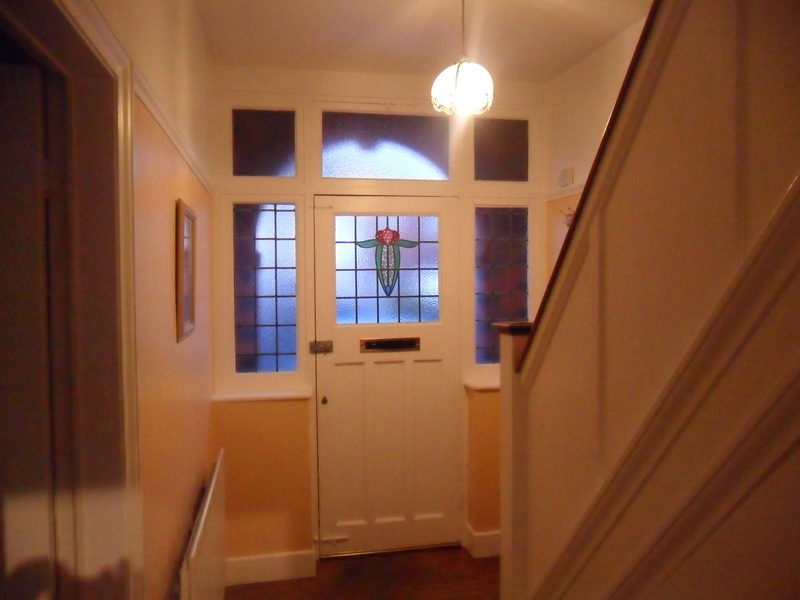 So I decided it was time I did the long overdue painting job on my hallway and landing. 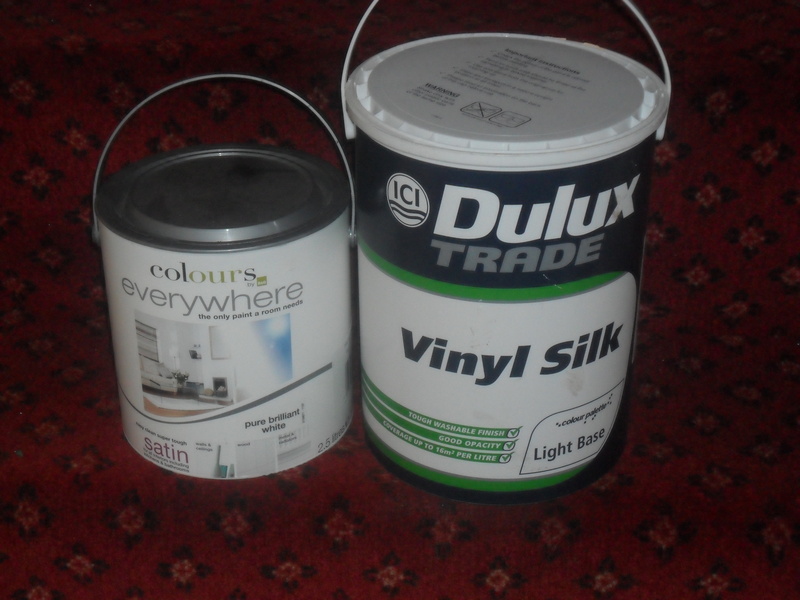 Over a year ago, my dad had some dated B&Q vouchers given to him (compensation from his housing association), which he knew he wouldn’t use, so he bought me some paint for my hallway. I was really grateful to him as paint is expensive. As my daughter had problems with her asthma for months last year, I daren’t start to paint just in case the smell from the paint upset her even more. So that’s why it took so long to start. 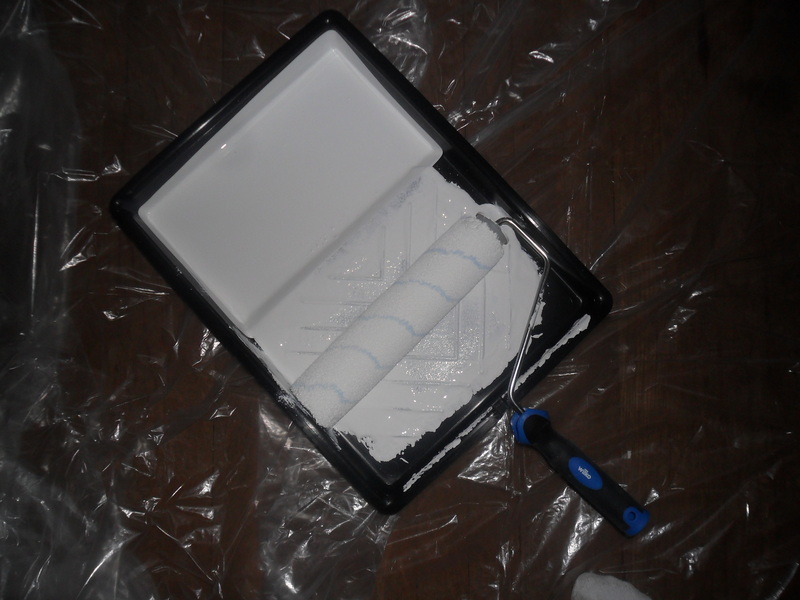 and then I painted the ceiling with a roller. 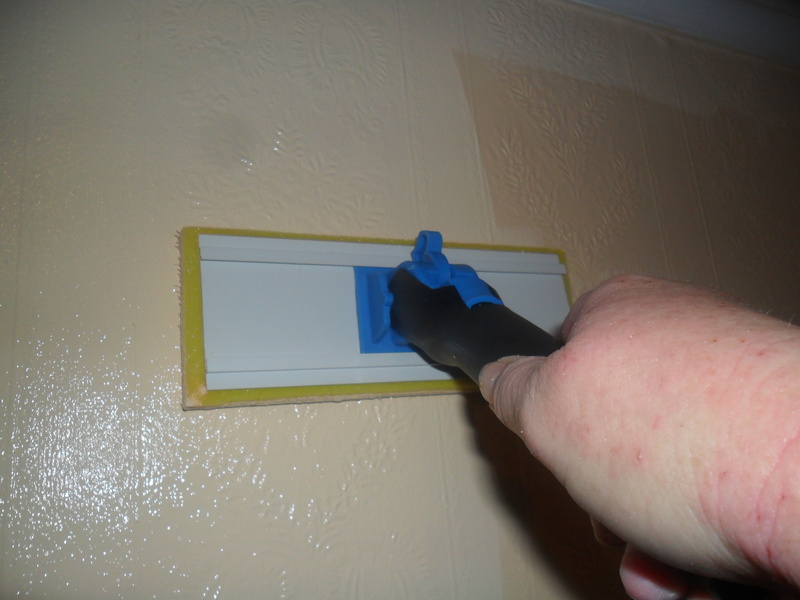 I used a paint pad to put the paint onto the walls, which quickly coated it well. 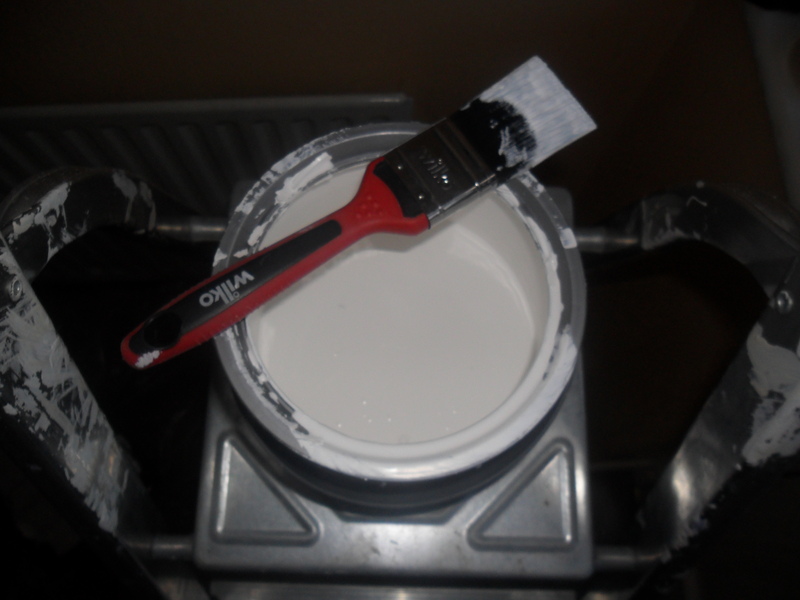 I only needed to use one coat of paint on the walls as it is a Dulux paint which is good quality and I’m actually painting it the same colour. I think the colour looks ‘homely’ with the good quality carpet that we inherited ten years ago, when we moved in. 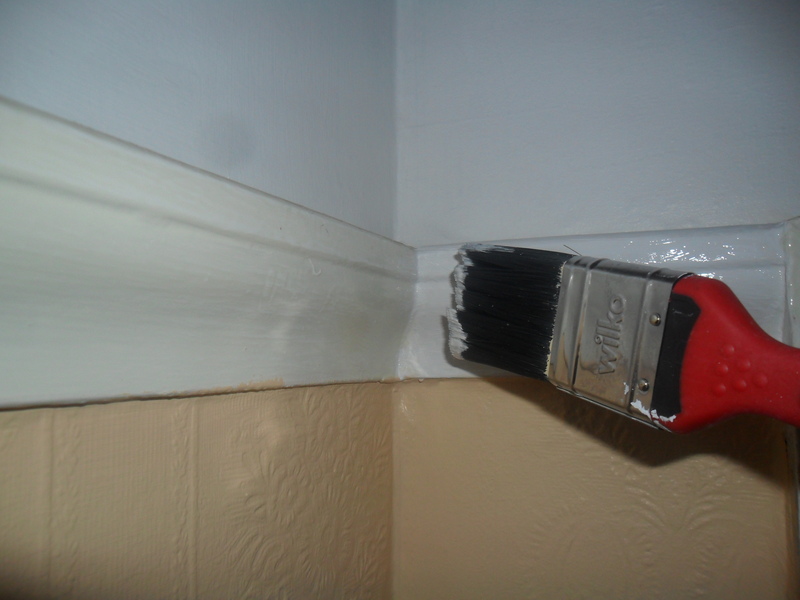 I am not the best painter around, so I used masking tape to cover the woodwork while I painted the walls. Afterwards I started on the woodwork. 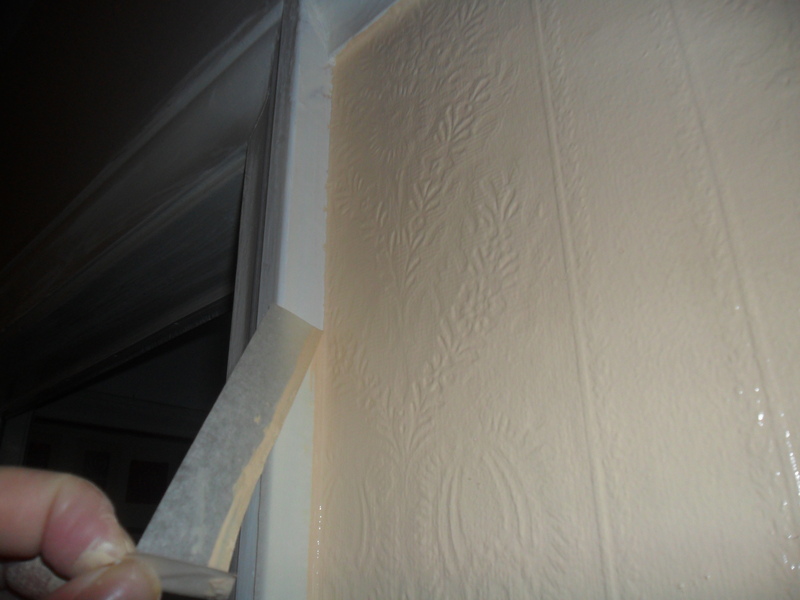 In the past I have always used gloss, but it really does smell, so I’ve used a B&Q ‘Anywhere’ paint which is waterbased. I used it in my both my daughters bedrooms and it has been fine, I so I thought I’d give it a try in the hall. I’ve still got to finish the woodwork, but I quite enjoy doing it when I’m listening to our local radio station. I find painting very therapeutic and it will be so rewarding when it’s finished. 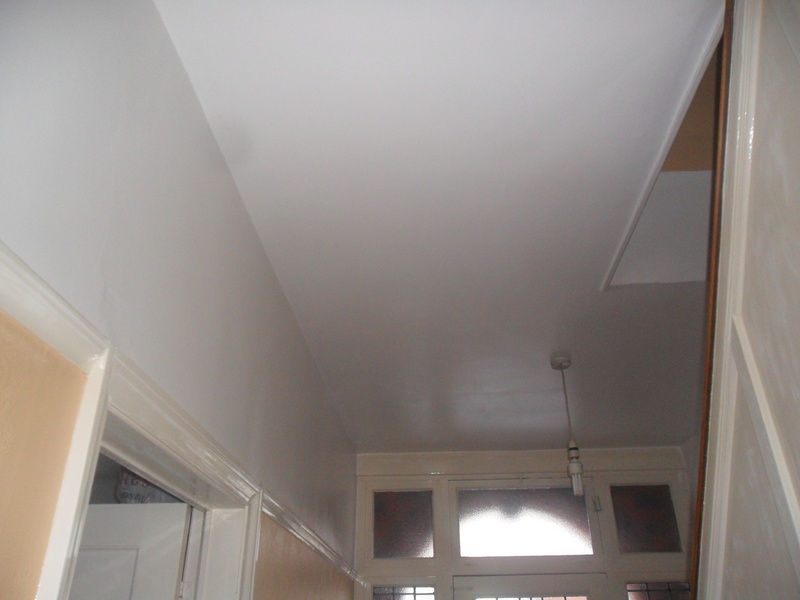 Painting your house yourself, is far cheaper than paying for a professional to paint it. Claire went on to say, the area was a triangular section about 12 ft wide and 6ft deep, with really heavy clay soil and the area is in full sun most of the day. 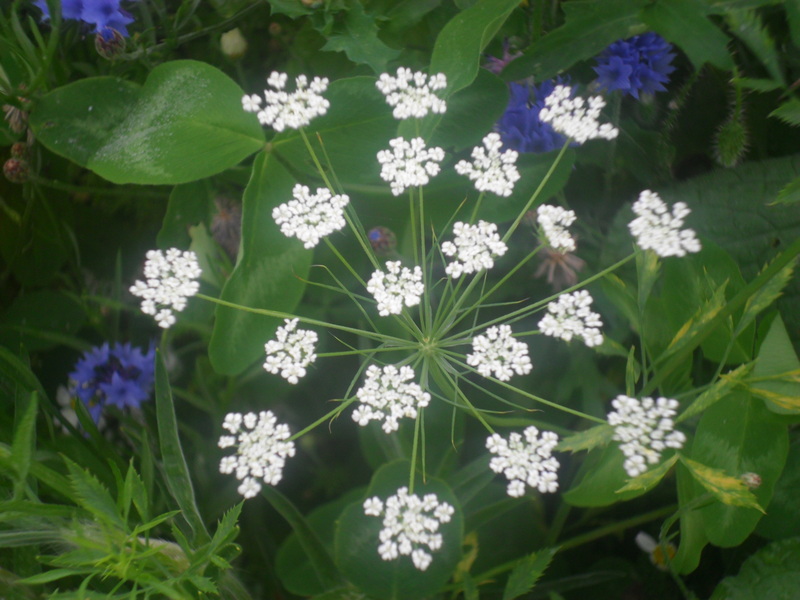 I would love to help Claire and anyone else that is interested, so I thought I’d write about small gardens today. The first house we lived in was a small terrace house. This is the first house my two daughters knew and I have some lovely memories here. We lived there for six years altogether. Though the garden was still very young, I packed it with plants, pots, hanging baskets and trellis, to give it an ‘established’ feel with some ‘height’. I think it’s best to use every bit of space in a small garden, including the walls and fences where you can grow climbing plants such as clematis, honeysuckle or even runner beans (which have lovely red or white flowers before the beans start to grow). Every plant needs to earn its keep. 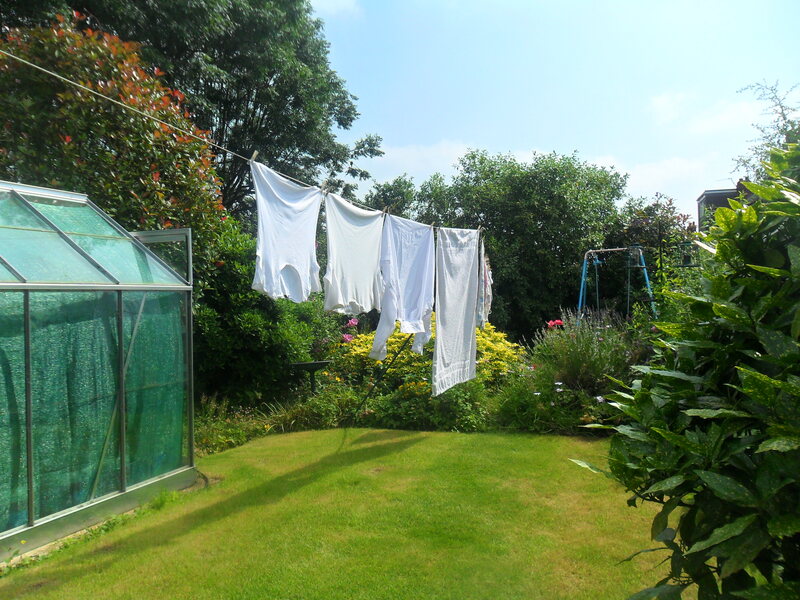 It’s no good having a beautiful garden in summer, but a bare garden for the other three seasons. It doesn’t cost so much to buy plants and maintain a small garden. 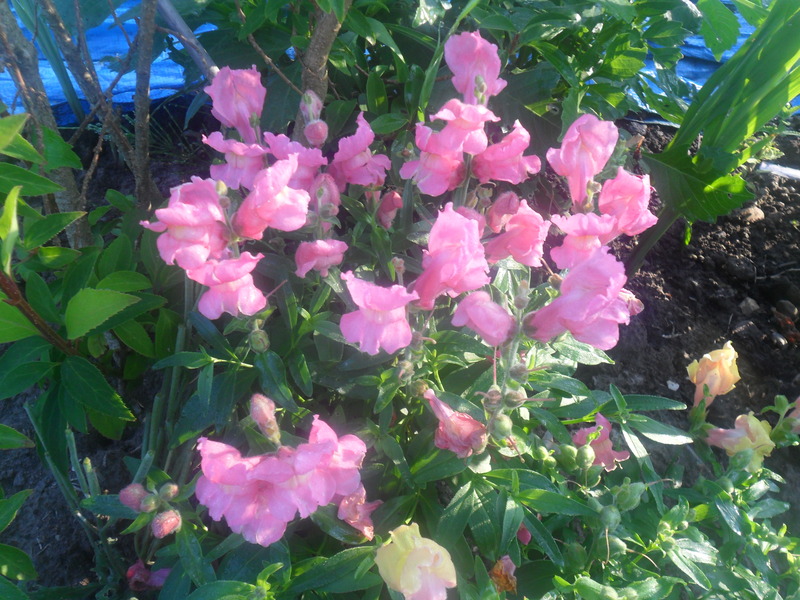 It is less work to maintain a small garden. 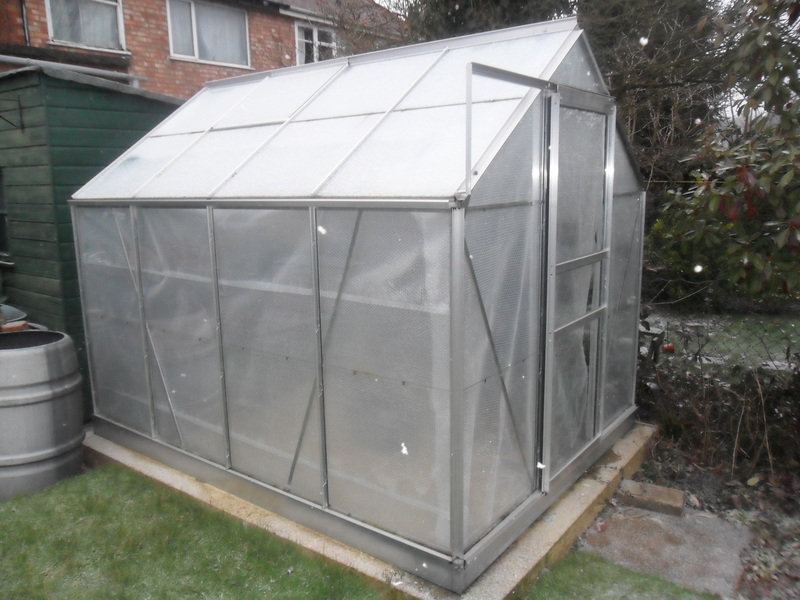 It can be sheltered from wind and frost, so you can have a bigger range of plants. Your boundaries are smaller, so it can feel more secure. Smaller gardens have less grass, or no grass to mow. If you have small children, it’s no good having the garden completely full of plants as they need a place to play, even in a small garden. 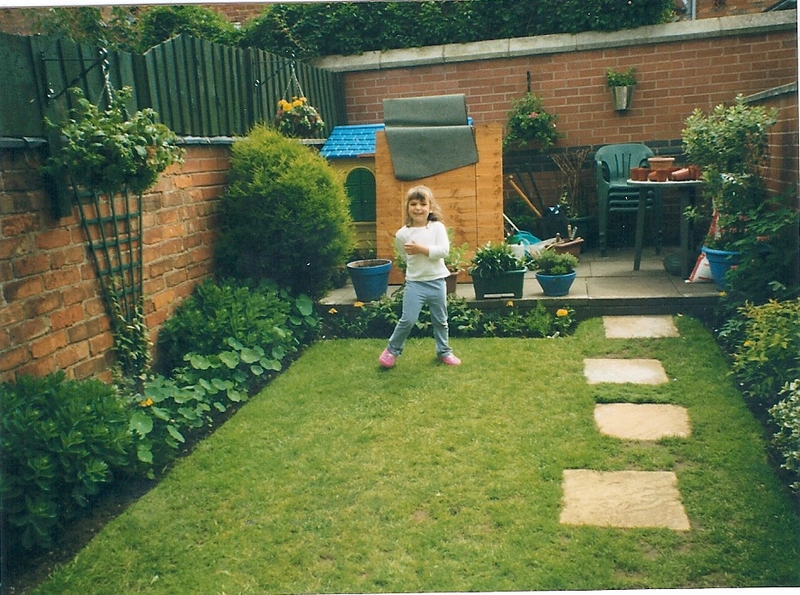 In our first garden, we managed to have a small sandpit, a ‘Wendy house’ and we screwed a small chalk board onto our house wall so my daughters could play. If you use your imagination you can come up with all sorts of ideas. 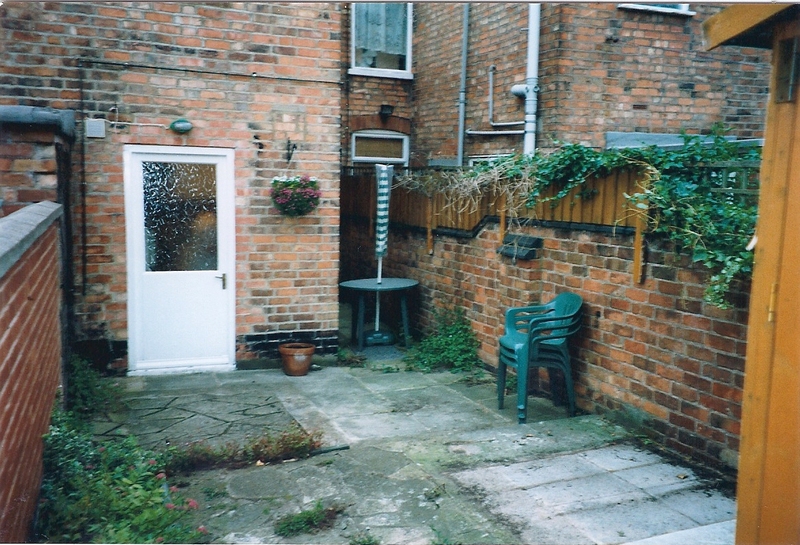 Don’t forget you need somewhere to sit, even in a small garden you need to be able to enjoy it. Don’t forget the birds. If you don’t feel you have a space for a bird table, then try and include one plant that has berries when food is scarce for birds e.g. Pyracantha or Cotoneaster. 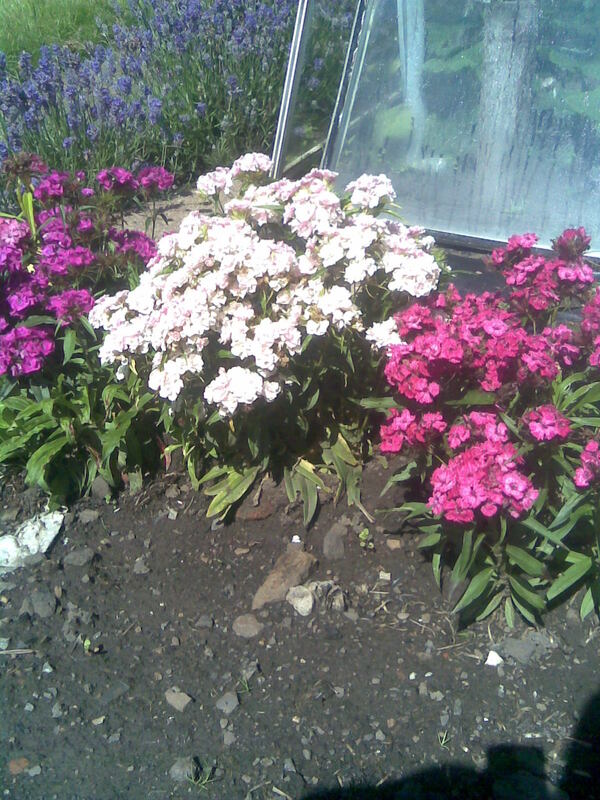 If you can possibly wait, it’s cheaper to buy smaller plants which allow your garden to fill slowly. You can use annuals plants to fill in the spaces (plants that complete their life-cycle in just one year or more, usually in one season). Pick plants that earn their keep. 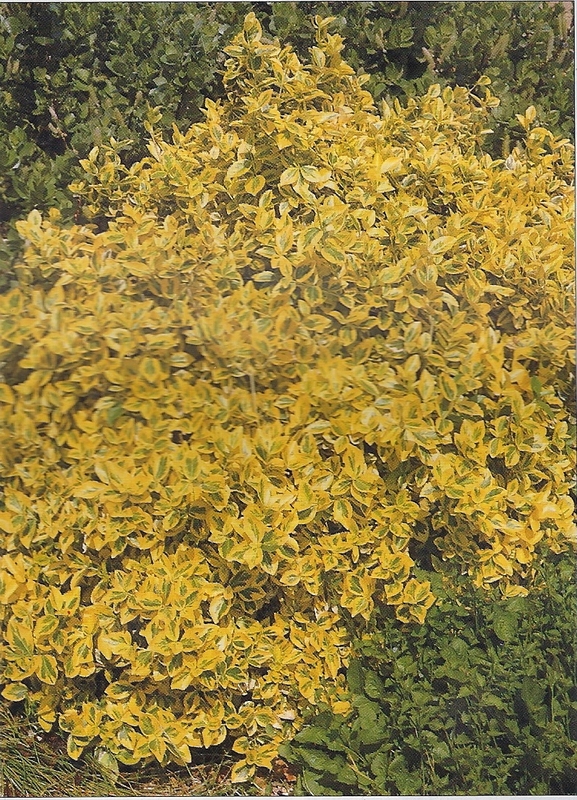 Evergreen shrubs give colour throughout the year, they are not always green, some are varigated and some are even yellow. 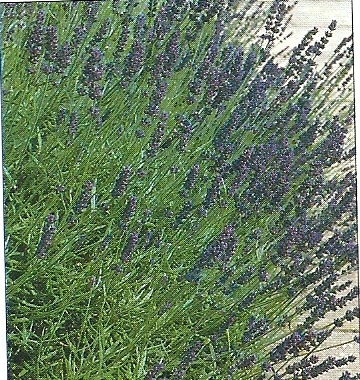 Try to have some ‘all year round interest’, so it pays to do your homework before you buy a plant. Try to keep colour schemes simple and try and use different leaf and plant shapes in your garden. Use fences, walls etc. to grow climbing plants that will add interest all year round e.g. Clematis for spring, Sweet peas for summer, Boston Ivy for autumn, Ivy for winter. 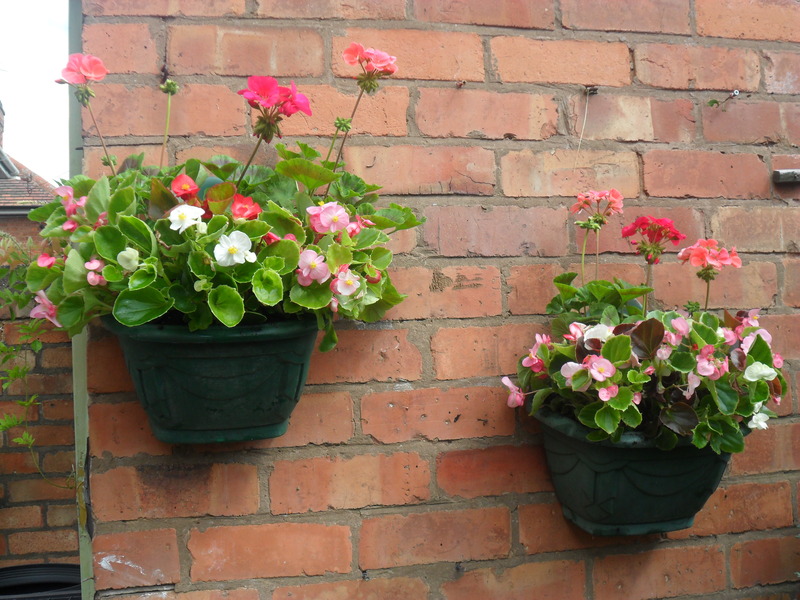 Don’t forget to use pots and hanging baskets, to give height to your garden. Grasses are brilliant in small gardens as they are hardy and can be all different sizes and colours. 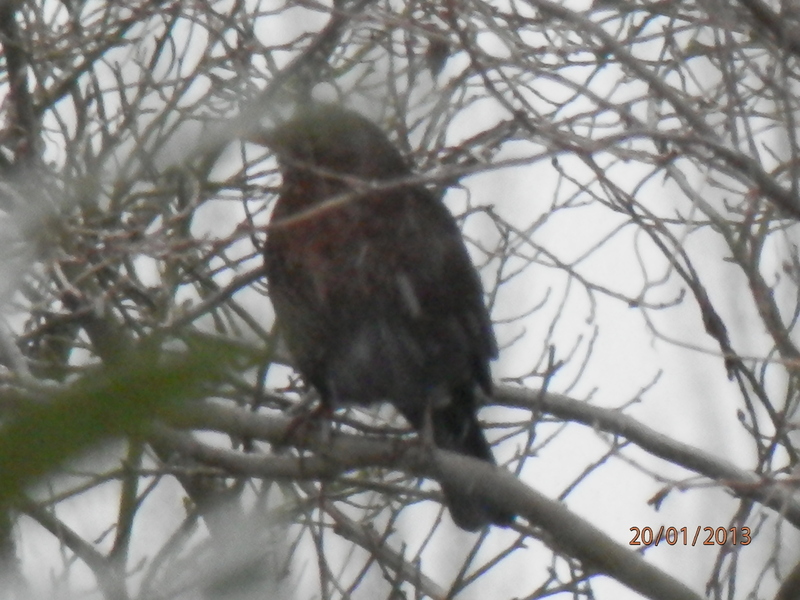 They also provide movement in the garden as they sway in the wind. Don’t forget the use of bamboo. Bamboo has been given a bad press over the years, as it’s invasive and hard to get rid of it once it is established. I saw a clever idea once in a small garden; the owner had put the bamboo into a pot and put the pot into the ground, with just an inch of the pot above ground. This kept the bamboo contained and it looked beautiful in the garden. Try and get plants that are different heights to give a bit of interest in your garden. 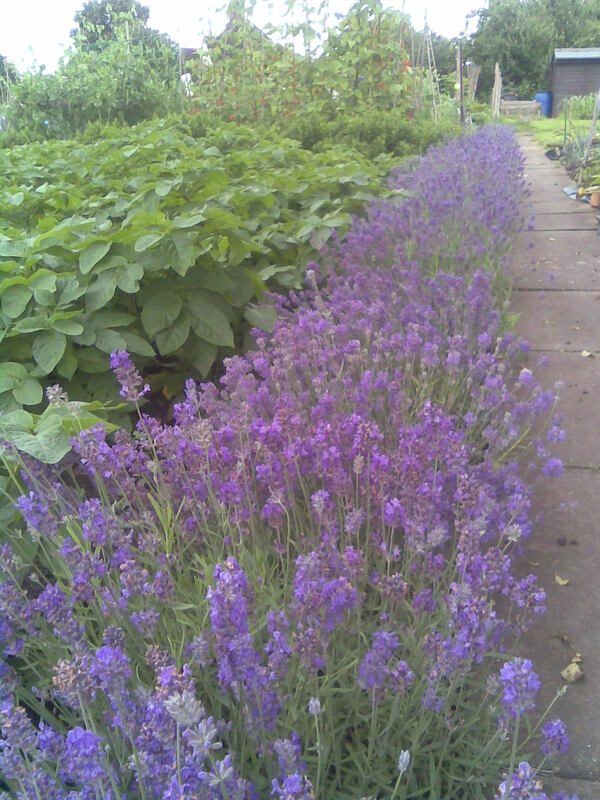 Put the tallest at the back of a bed, middle sized plants in the middle and the smallest at the front. 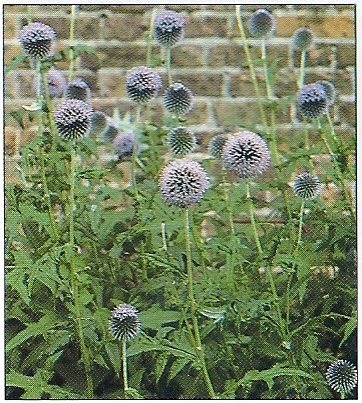 Tall plants that can be used at the back of a small bed are Echinops, Giant Michaelmas Daisy’s and Echinacea’s. 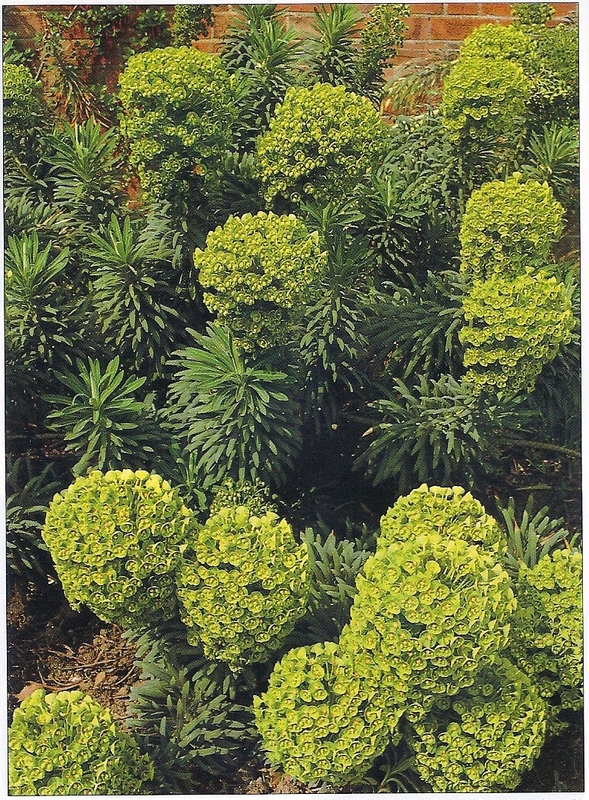 Euphorbia (as with all Euphorbias, do be careful as their milky sap can irritate your skin). 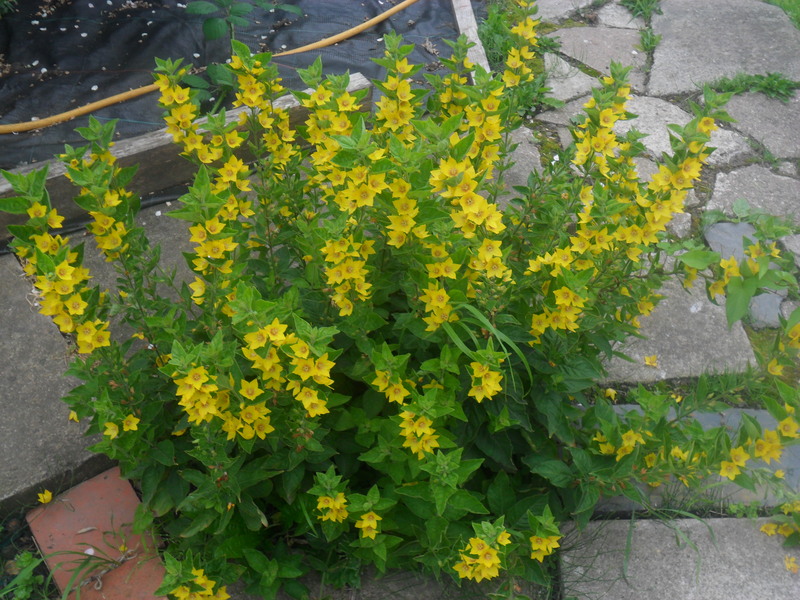 There are also loads of other plants you can use for small gardens. You can find some here and here on two great websites. I hope I have helped you Claire, with your garden. Now you have the hard work of looking at all the different plants that I have suggested and deciding what you would like to grow. Look at the height and spread that the plant will eventually grow to and be careful not to plant all your lovely new plants too close. 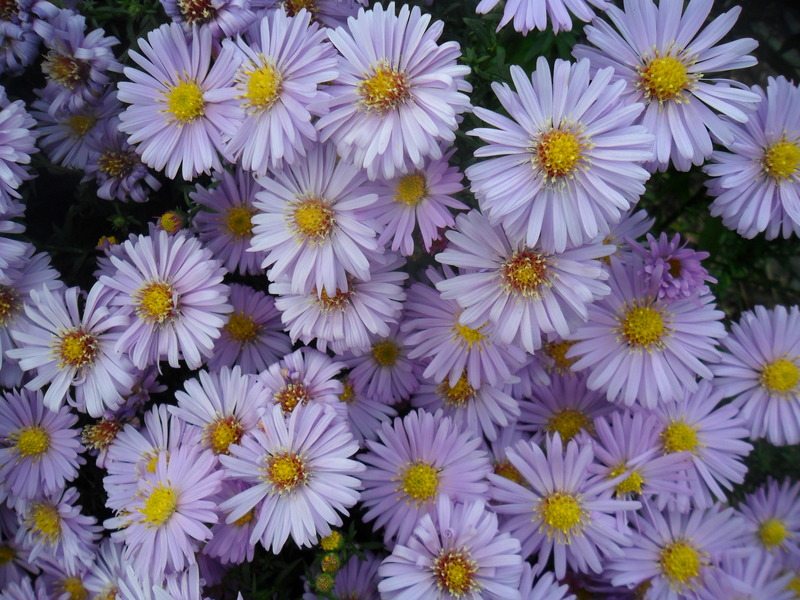 Wait until the ground is not wet or frosted before you plant them. It is probably best to wait until spring now before you start, but that doesn’t mean you can’t plan. Wilkinsons sell plants in Spring (sometimes before) which are cheap, but I do find some of their plants have not been kept very well, so do check them to make sure they are moist and do not show signs of dieing. 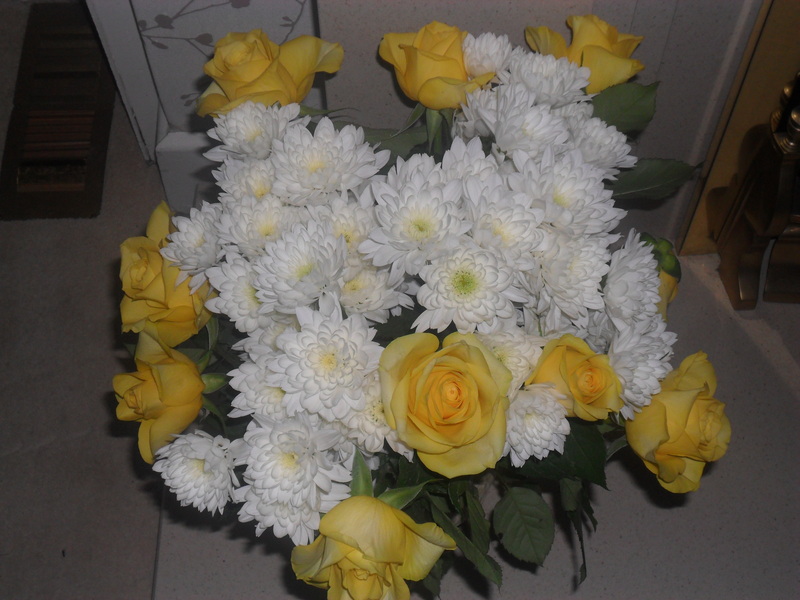 Look out for plant sales at school fairs etc. as you can get some real bargains there, but the only drawback is you don’t usually have any details about the plant, except the name. Do ask if anyone on the stall knows the height and spread as you may be lucky. You can buy particular plants on line too, but I find the very best place to buy plants are plant nuseries and large garden centres. 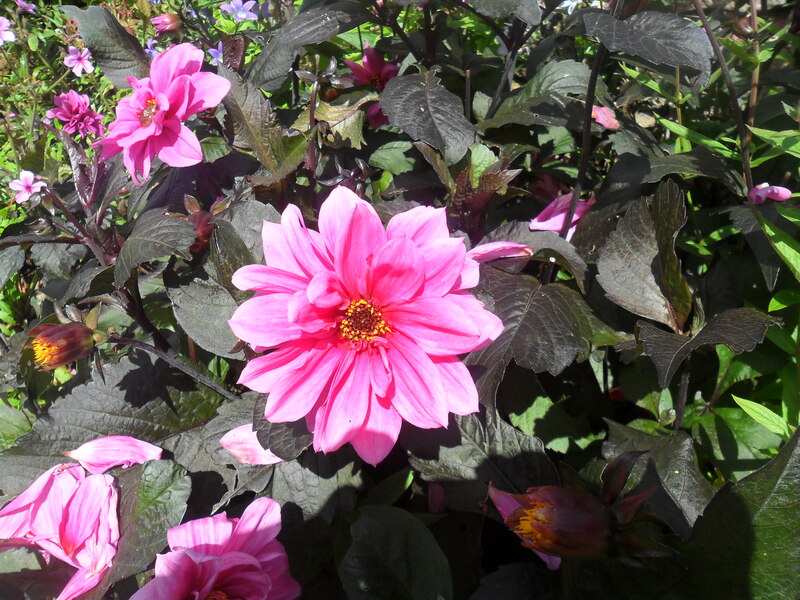 Do ask for advice if you are at all unsure, as a good garden centre will know the answer. I hope I have given some good advice here today. It’s been snowing all day here. Over the last two weeks I have been sorting all of my seeds out. As I have four allotments, I do need a lot of seeds. I have a spreadsheet with all the seed packets listed on it, this way I know every single packet of seed that I have and the date they need to be used by (though some seeds I keep an awful lot longer than the date on the packet e.g. brassicas, as I know they will be ok to use a long time after the ‘sow by’ date). 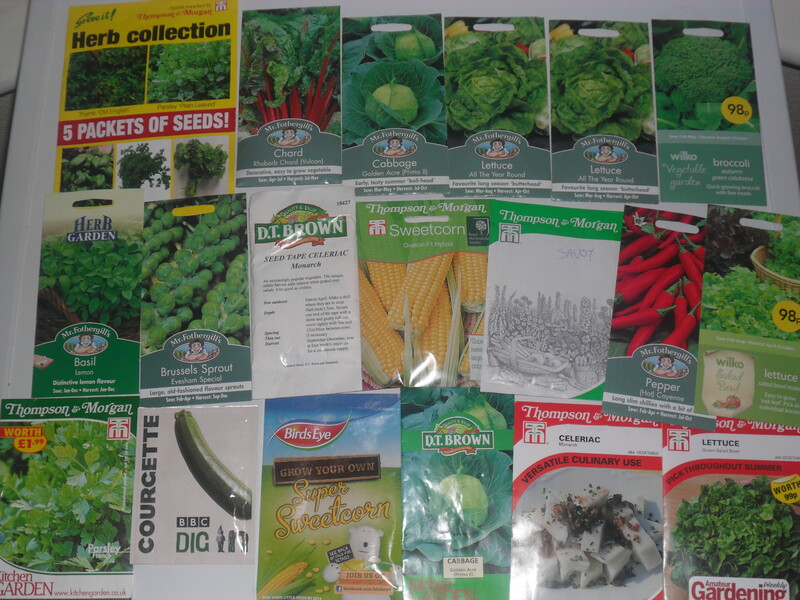 I do have a weakness with seeds and I find it hard to resist a free packet or a bargain, so after sorting them out I found I had quite a few duplicates. 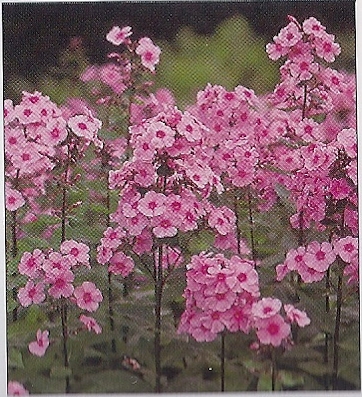 I have never sold seeds on EBay before, but as there were so many I decided to give it a try. I’m not sure if they will sell or not, but I will let you know. 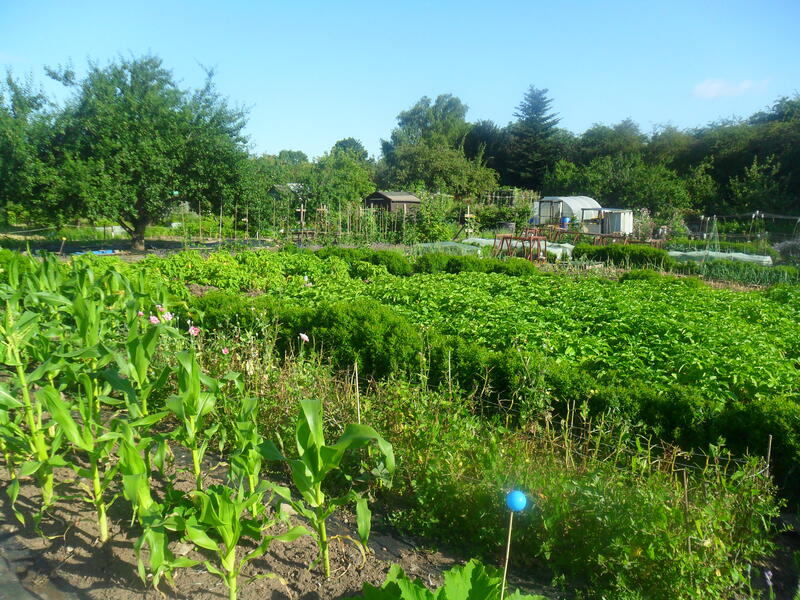 During the next week I will be sitting down and working out exactly what vegetables and salads I want to grow on my allotment this year. After this I will work out a month by month plan, showing exactly when to sow my seeds and whether the seeds need heat or not. I will show you the end results after I have completed this. 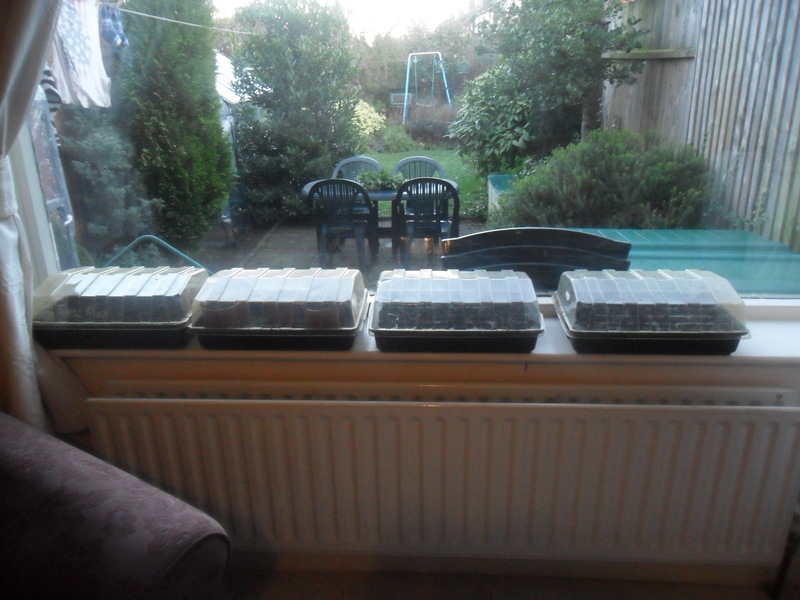 Over the last two weeks I have sowed my first seeds for 2013. 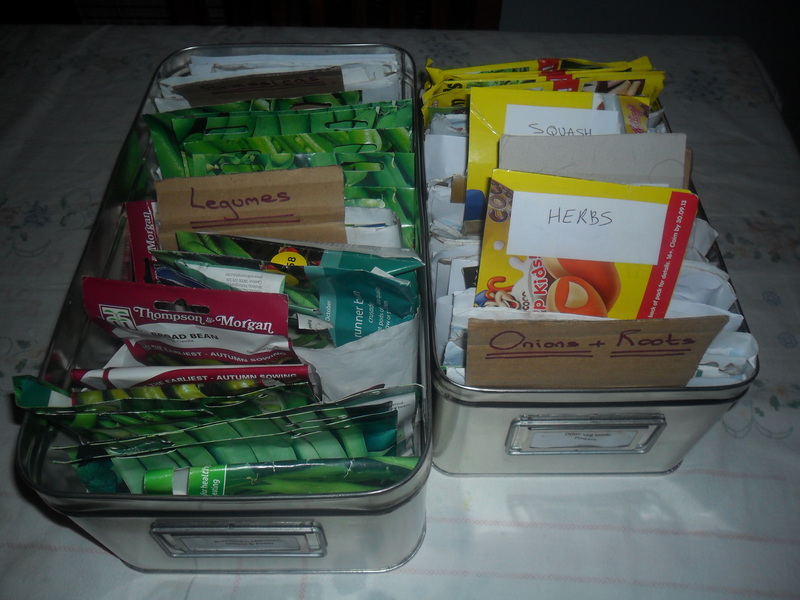 Before I did this I made some more seed labels and in Mrs Thrift fashion, I made them for free. 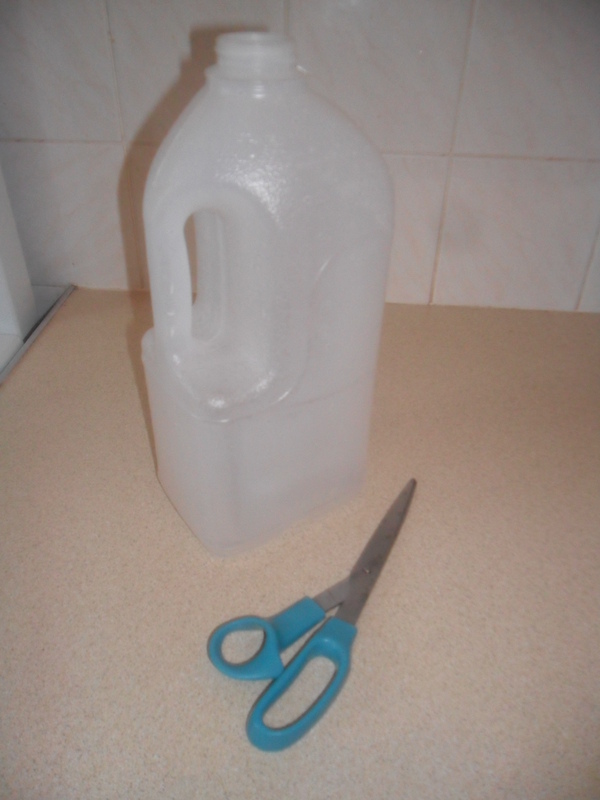 All I use is an old plastic milk bottle that has been washed out. 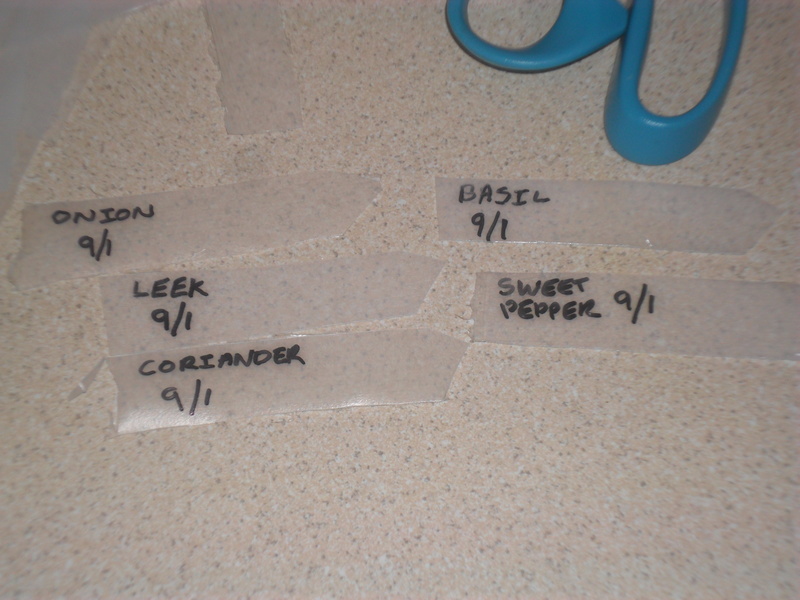 I cut it up into labels, with a point at one end and write the plant type on the label in permanent ink. 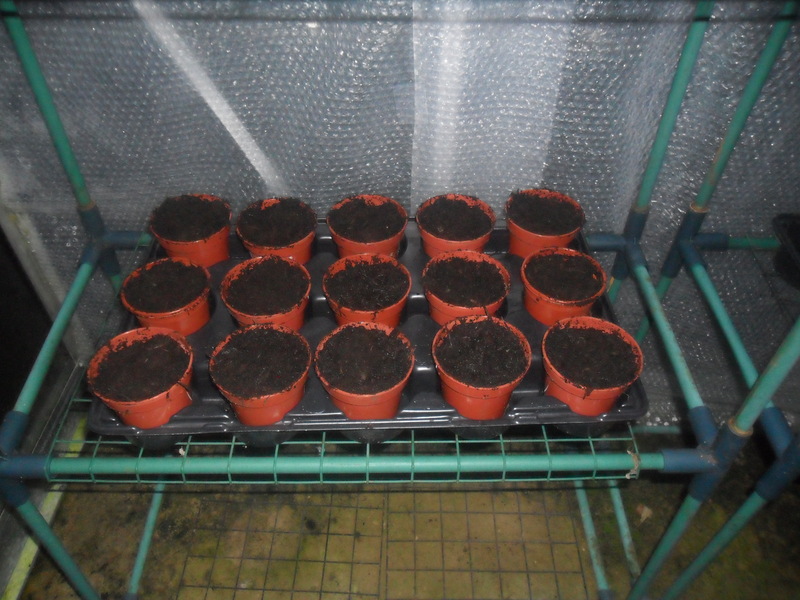 The seeds I sowed were sweet peppers, coriander, basil, leeks and onions. 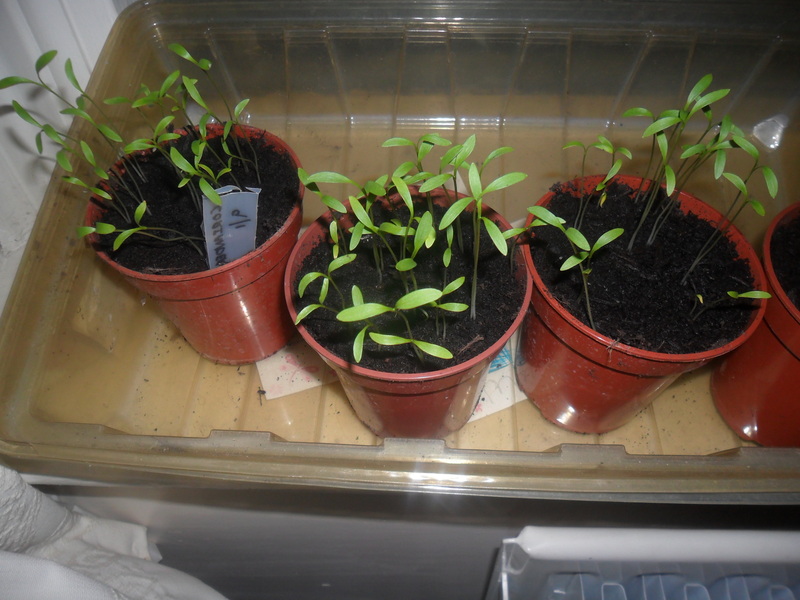 I have put these in a propagator on my window sill until they germinate, at which time the propagator lids will come off. 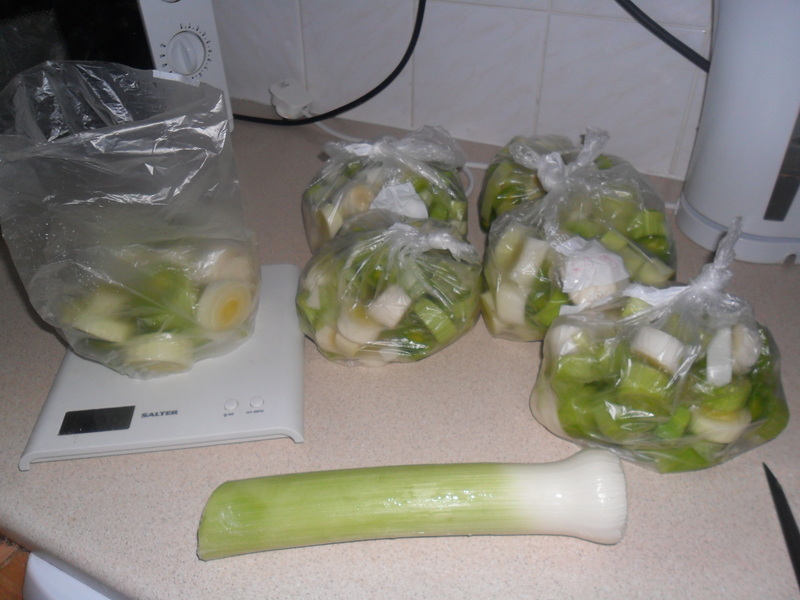 The leeks will then go into my unheated greenhouse, while the others will be grown inside my house, where it is warmer. I also planted some more garlic. Previously I planted some garlic at my allotment, but it has been so wet that hardly any have grown and I suspect they have actually rotted in the ground. As a back up, I have planted some more in pots, which I will keep in my cold greenhouse for now. The broadbeans that I planted in December are just poking there heads through the compost, so I am really pleased with this. 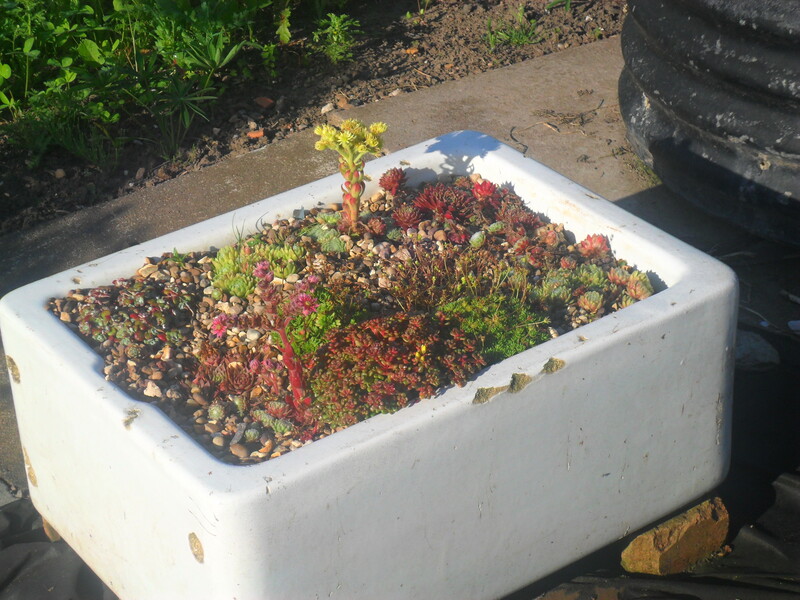 These were planted into cardboard toilet roll tubes. 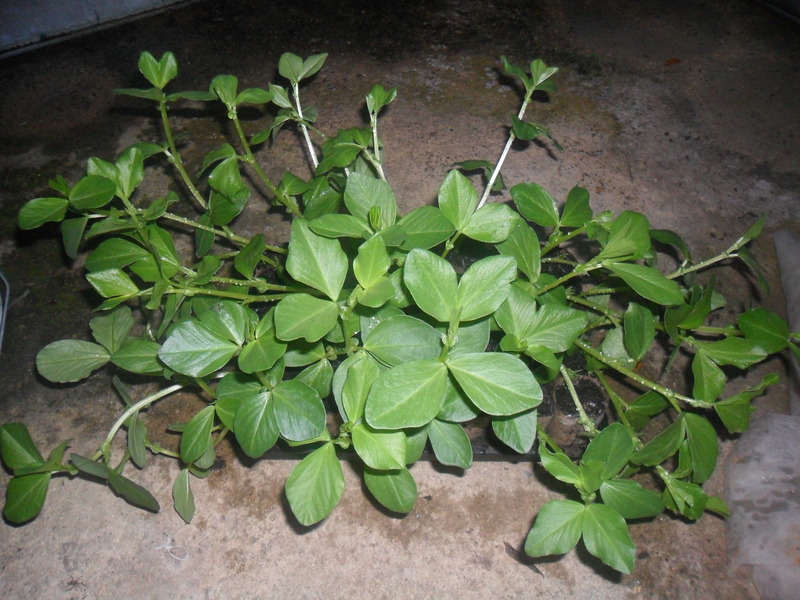 Unfortunately, the broad beans I planted in pots at the end of October are really very leggy and probably won’t make very good plants now. 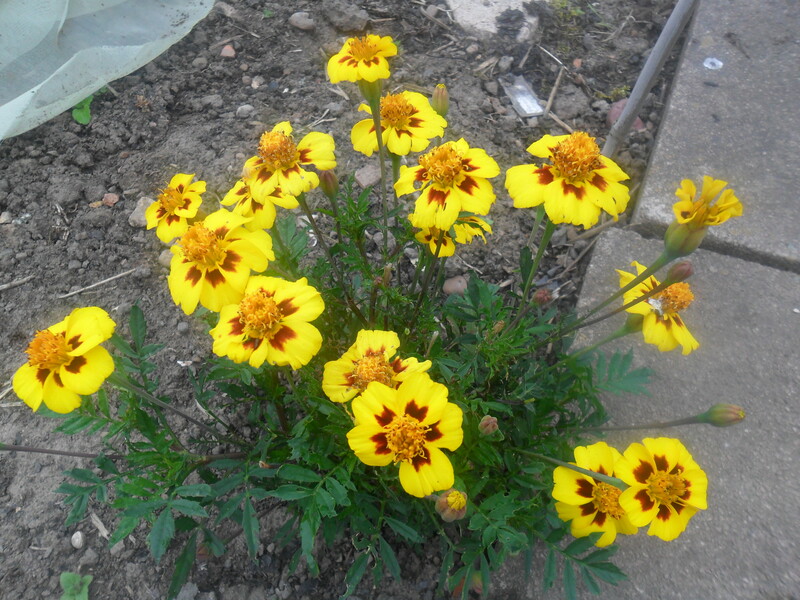 Unfortunately they are the result of mild weather and the fact that I haven’t been able to plant them into my allotment, due to the ridiculous amount of wet weather we have had for weeks on end. I may just plant them in my polytunnel to see what happens. 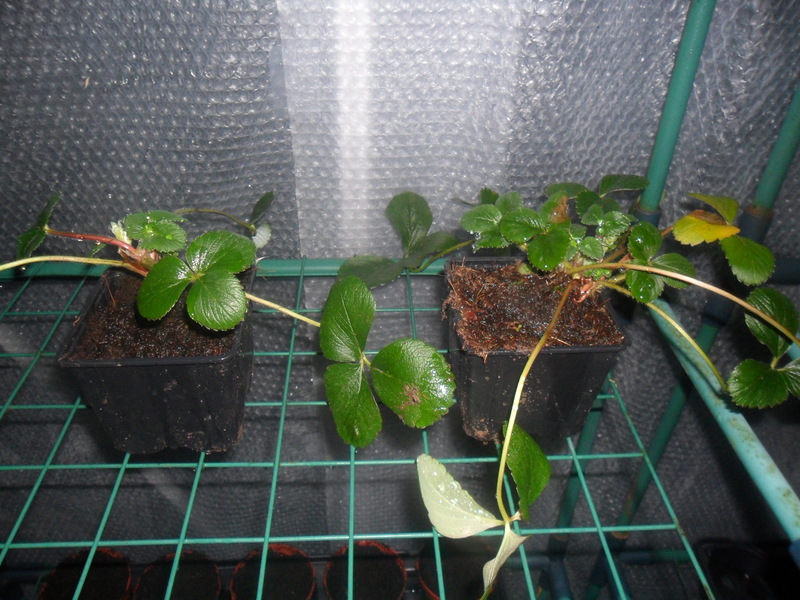 My two free strawberry plants from Spalding bulbs are still sitting nicely in my cold greenhouse. I will plant them in the spring. Last week I brought my seed potatoes. I usually buy them from a place called ‘Hawgrips’ which is in Enderby, Leicester. 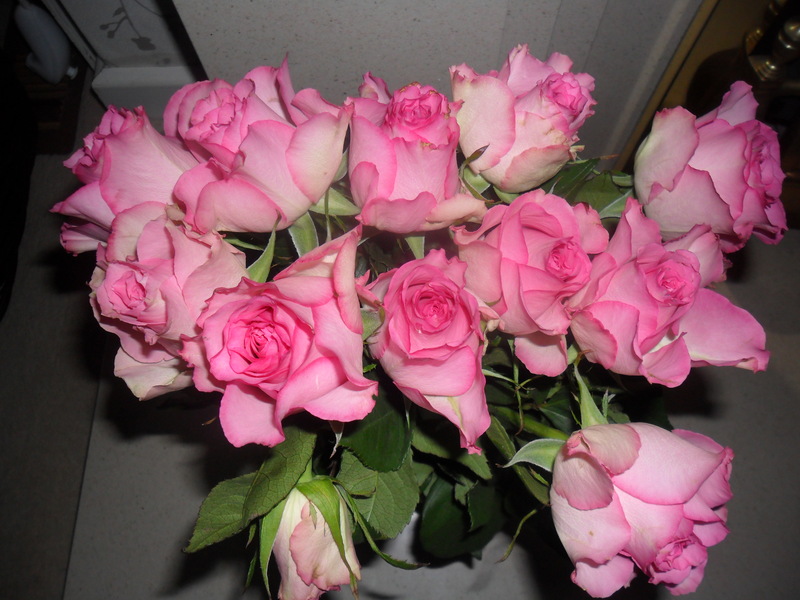 I like to buy them early as I get a bigger choice of varieties to choose from and I make sure I get the ones I want. I also like the fact that you buy them loose, rather than in bags, as I work out exactly how many I need and just count them into bags. Picasso (an early maincrop so this helps to miss the blight). This year I have decided to also grow ‘Desiree’ potatoes, after much discussion with one of my fellow allotment friends. I had such a big problem with slugs last year and my friends’ Desiree potatoes didn’t seem to have a problem, so I thought I’d try them. I let you know how I get on. When I bought the potatoes home, I put them into trays to ‘chit’ them. 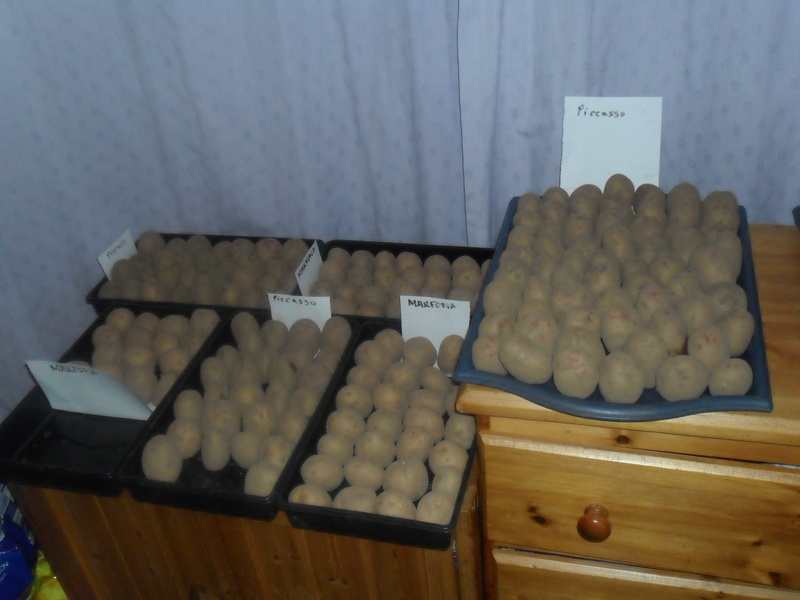 ‘Chitting’ just means that you are encouraging the seed potatoes to sprout before you plant them outside. 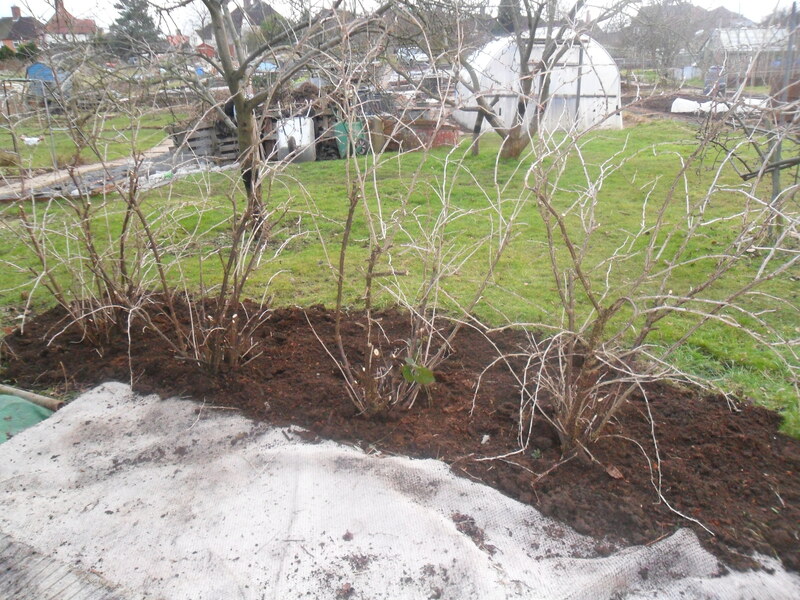 All you need to do is stand the tubers with the eyes facing upwards, in trays or old egg boxes. 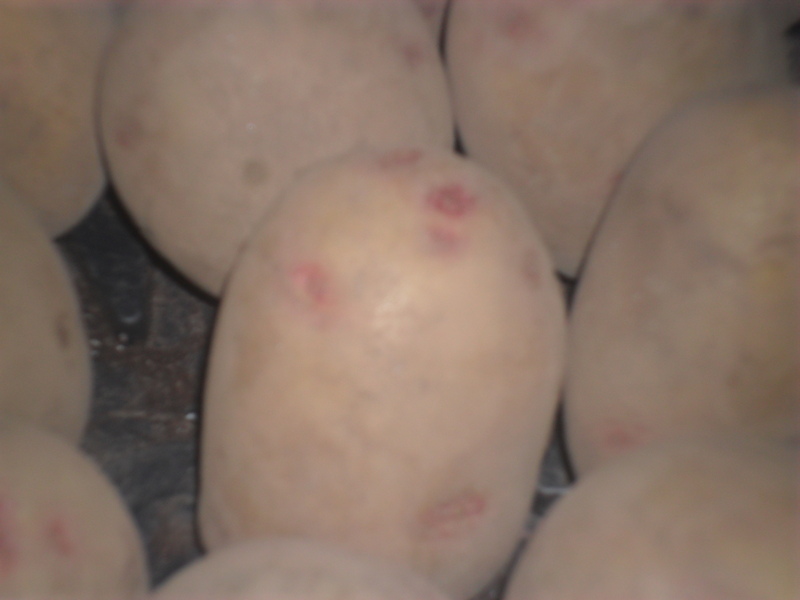 Contrary to popular belief, chitting potatoes is not essential, except for early varieties, to produce an earlier maturing crop. However, if you buy your main crop early like I do, then you may as well ‘chit’ them as well. Place the potatoes in a cool, light place. I leave mine in our bedroom, as it’s the coolest room in the house…so romantic! I hope we have a better crop of potatoes to harvest this year, as they were full of slug holes in 2012. Thank you for all your comments over the last week, it is so lovely to hear from you. I’m sure we can all help each other with useful tips and advice, especially in the current climate, so please keep commenting if you have five minutes to spare. 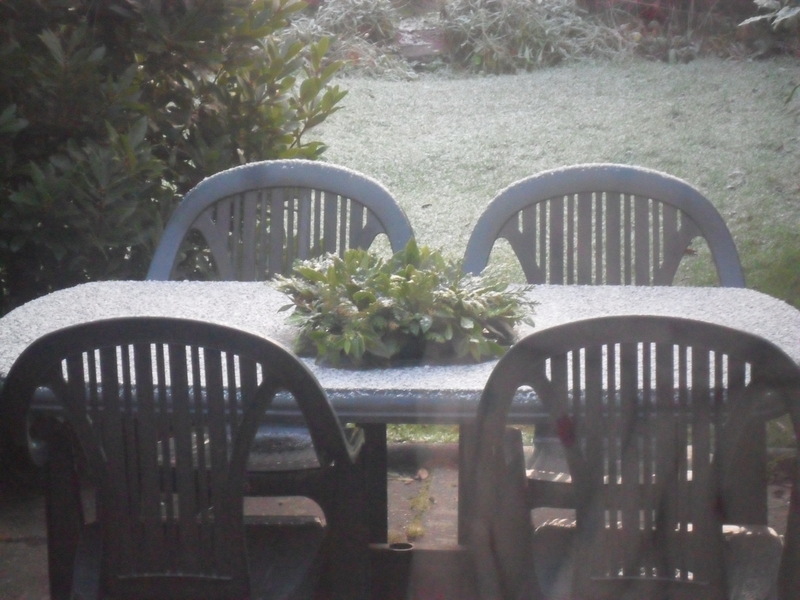 When I woke up this morning I was greeted with snow. It was such a lovely site. It snowed for another few hours during the day, but the roads were pretty clear and my daughters came home safe from school. The view from our upstair bedroom. Yesterday, before the snow, I looked out of my back room window at the table wreath, that I made a few days before Christmas. 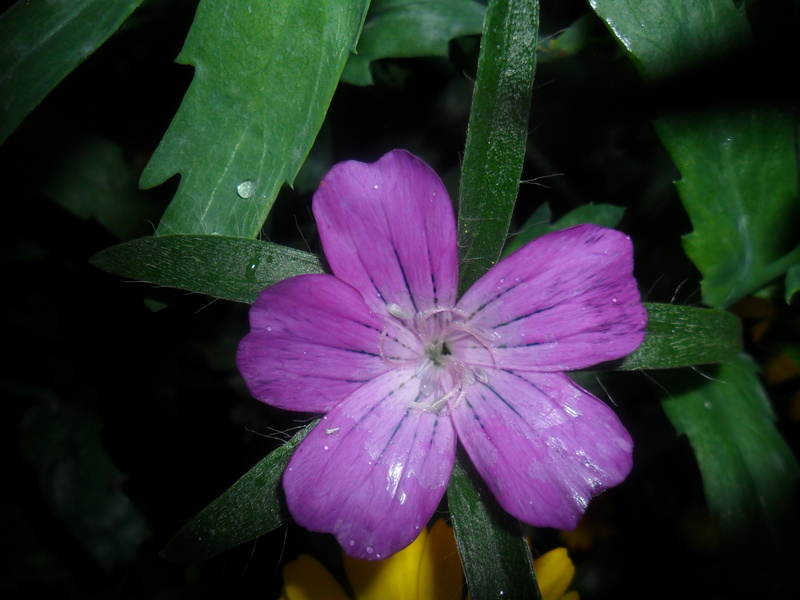 I put it outside on our garden table, a couple of days after Christmas day. I thought I’d show it to you, as I’m amazed as it still looks good. I thought it would only last a few days. I think it’s something nice to look at when I stare out the window. 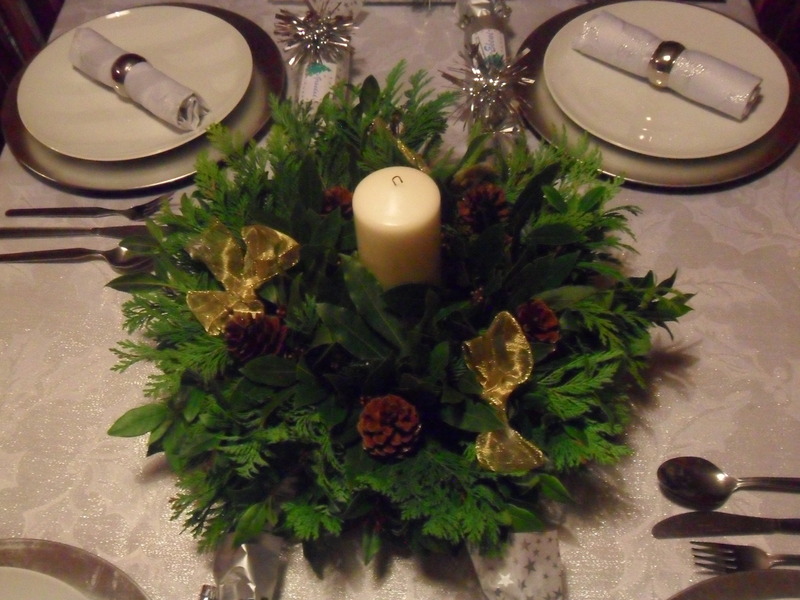 You can see how I made the Table Wreath here. Yesterday we had a lovely cheap Sunday lunch. I managed to get a pork belly joint, reduced to £3.75 from £5.71. It did taste nice though there wasn’t much on it, so we didn’t have any left for pies or curries, but it did make a change. 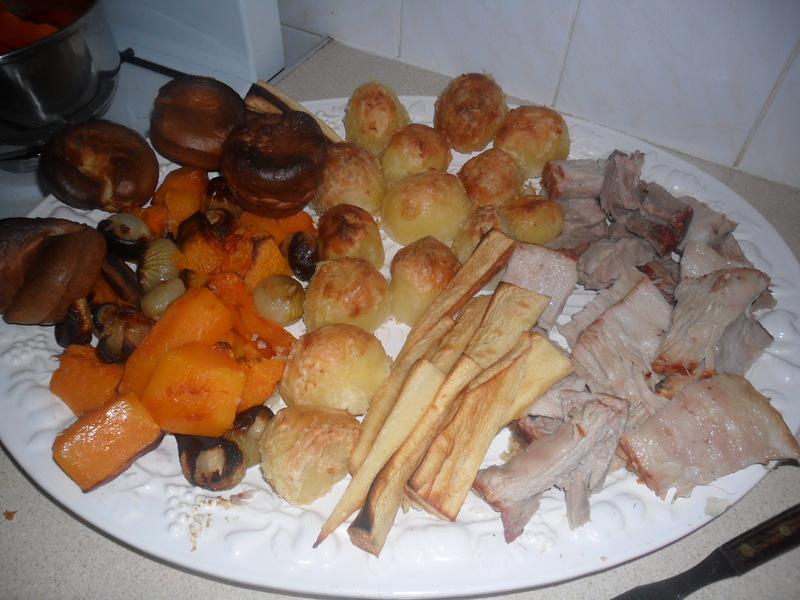 As it was Sunday, I served it with yorkshire puddings and a selection of allotment vegetables: Roasted potatoes, parsnips, butternut squash and shallots and boiled brussels, peas, swede and carrots. It was a cheap, but very tasty Sunday lunch. At the weekend I did my usual round of ‘Batch baking’. I started by making bread rolls ready for the week ahead, which I cut in half and froze. I made 20 rolls in total. I love homemade bread as it tastes so good and it’s free of e-numbers, chemicals and preservatives. I then made fruit scones for my youngest daughter to have as a snack at school, each day at break time. I also cut these in half, but this time I buttered them before freezing them. It’s so easy to pop a frozen scone into my daughter’s lunchbox in the morning and it’s defrosted by break time. You can find my recipe here. 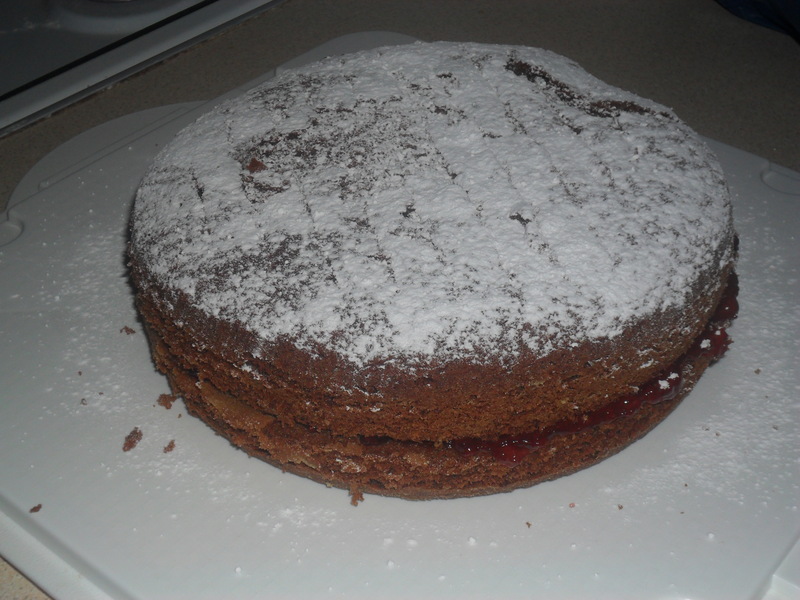 My youngest daughter loves chocolate cake with a filling of jam, so I thought I’d make one as a treat. It’s not perfect, but that’s the beauty of homemade cakes, they are always different each time you make them. I also made some naan bread to freeze, ready to reheat when we have our next curry. I find it’s cheaper to make naan bread, rather than buy it and it tastes just as good. You can find the recipe for my naan bread here. 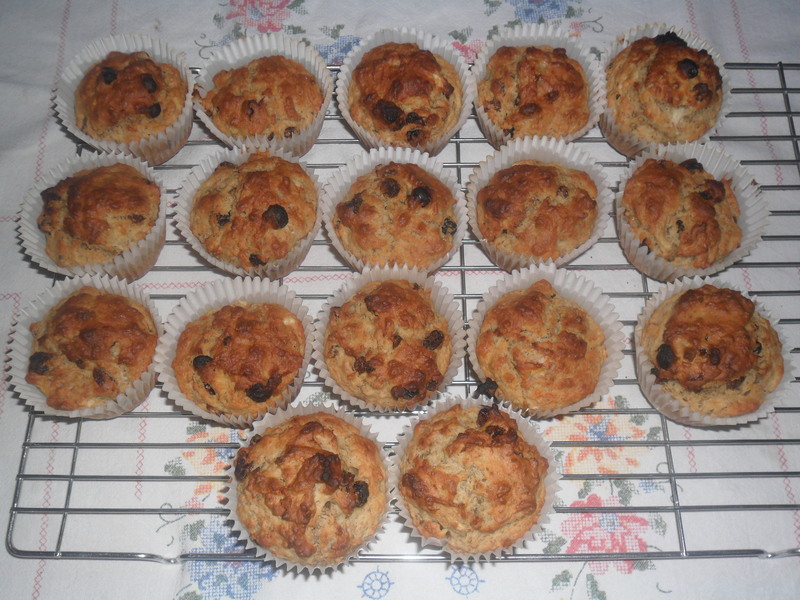 Finally, I made some ‘Breakfast muffins’. My eldest daughter is not good at traveling and if she eats breakfast before she goes on the school bus, it makes her feel travel sick. Therefore I like her to have something to take to school and have when she arrives. She is quite fussy about what she takes, so I came up with a ‘Breakfast Muffin’ which she seems to enjoy and it’s a lot cheaper than the cereal bars you can buy. Preheat your oven Gas 5 / 375F / 190C. 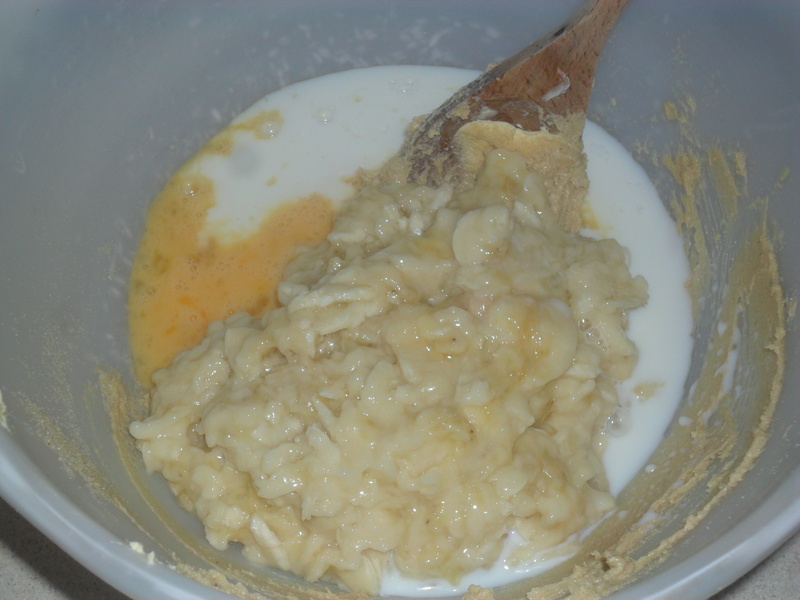 Stir in bananas, milk, vanilla extract, and eggs and combine them well. 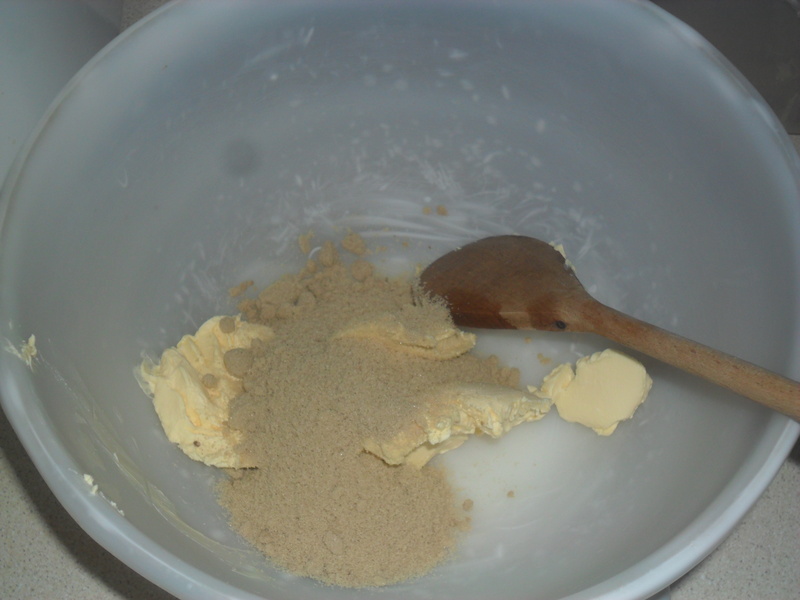 Sieve the flour and baking powder into the mixture and mix gently. 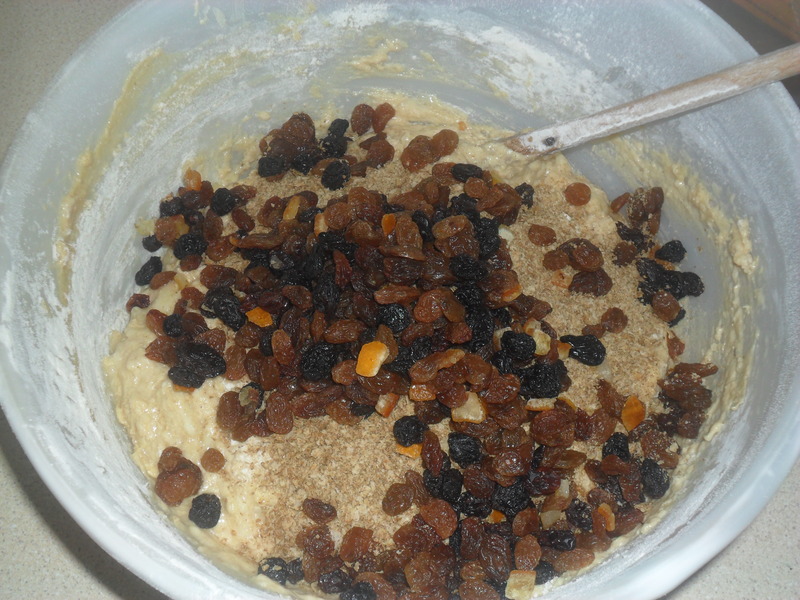 Finally add the mixed fruit and Weetabix and fold in gently. 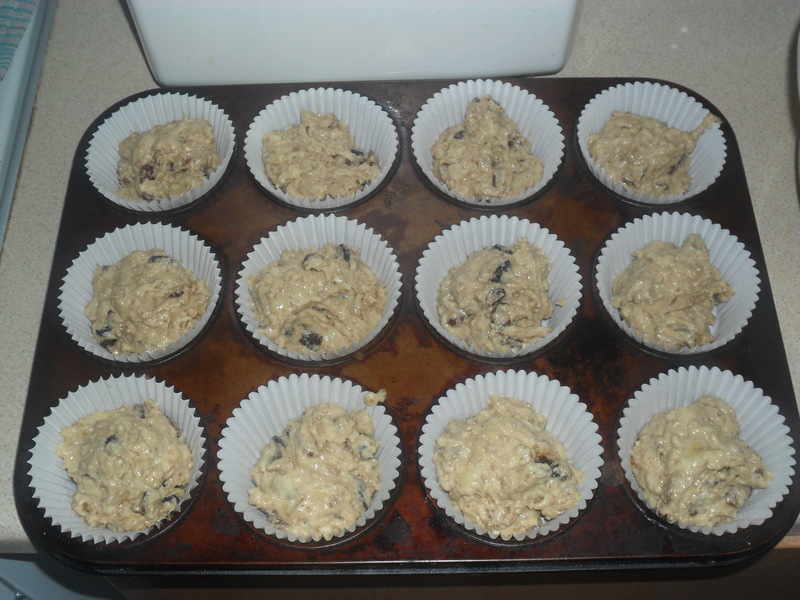 Half fill muffin cases with the mixture. These can be eaten on their own or served with a spoonful of natural yoghurt. 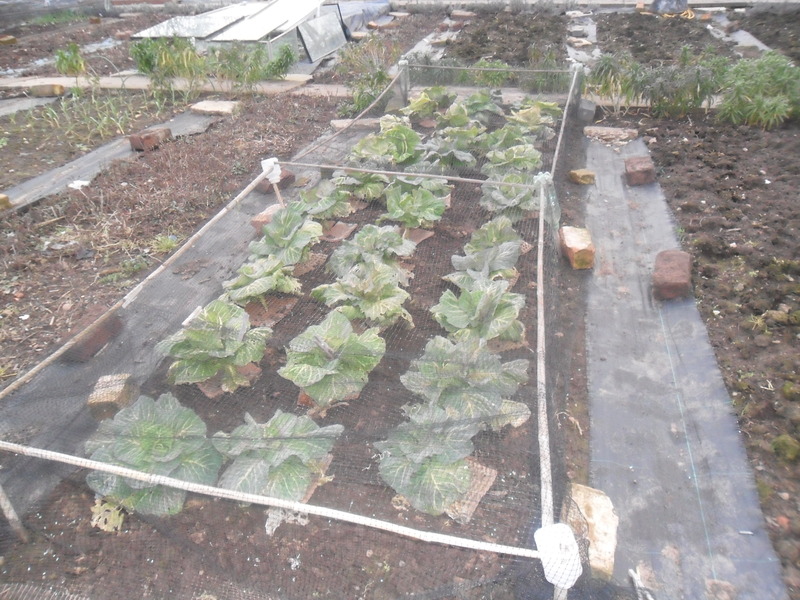 Check your nets are still in place to protect your brassica’s from pigeons. 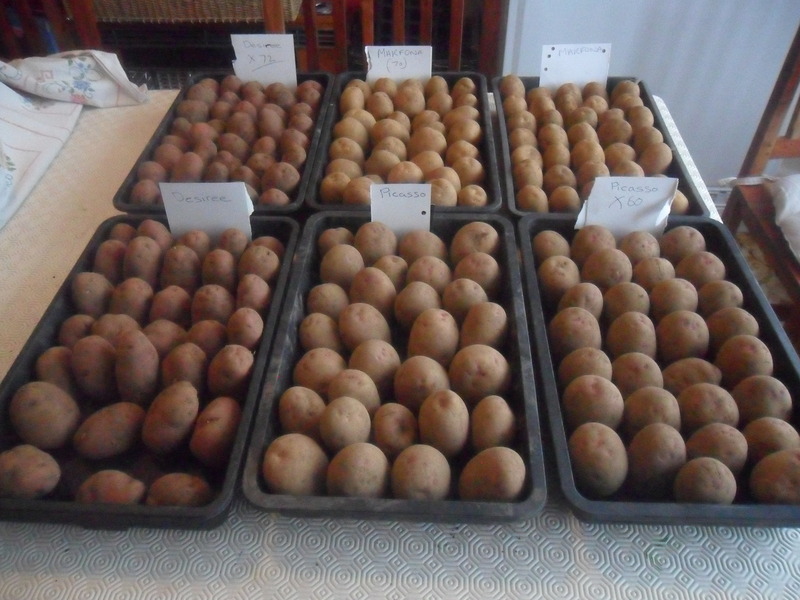 Start ‘chitting’ seed potatoes by placing them in trays or old egg boxes with their ‘eyes’ face upwards. Store them somewhere cool and light. 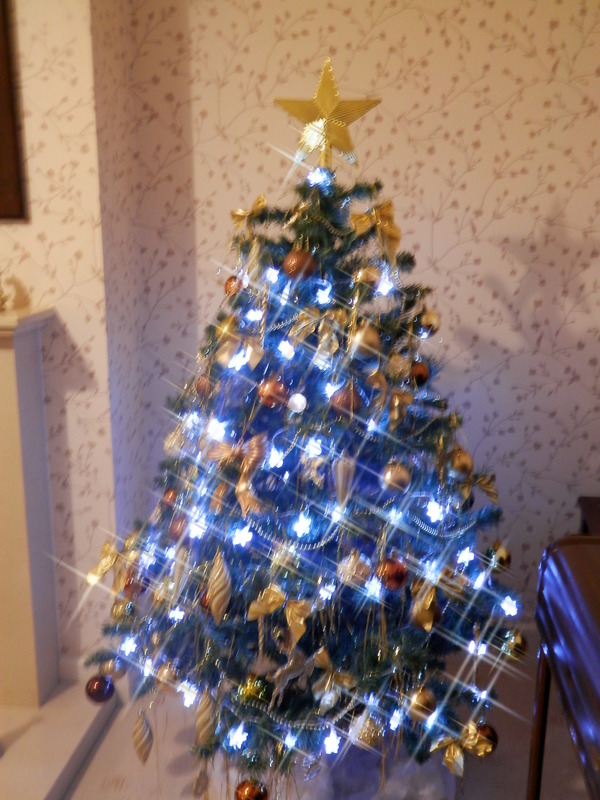 I hope you had a lovely Christmas and an enjoyable rest, I certainly did. Our Christmas day was great and everyone said they enjoyed the Christmas dinner I cooked. The £9 Aldi turkey crown fed us all well, with enough for sandwiches the next day and I also managed to freeze two portions for another day. 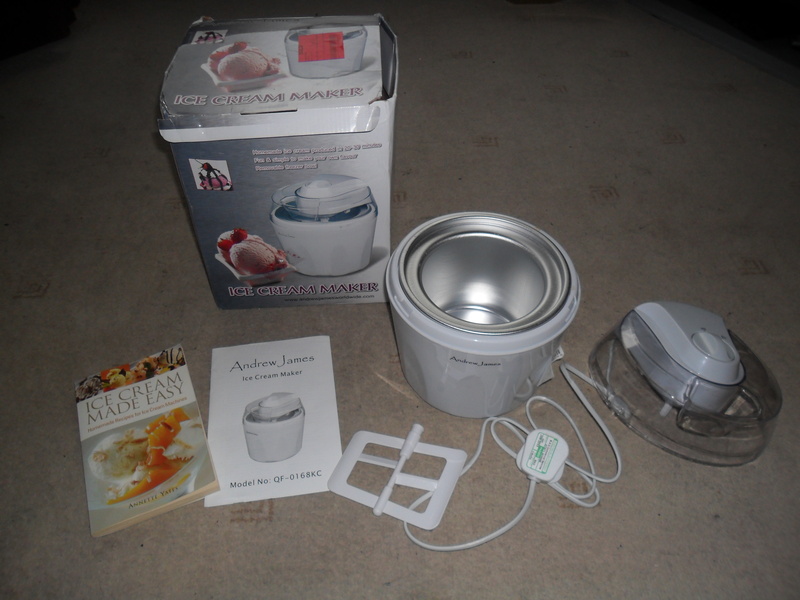 My favourite presents were a hand blender (as mine had broken), two cake tins, two more cooling trays, a cake slice and a note pad for my kitchen. I so LOVE useful presents. 2012 has been one of the hardest years we have had to deal with as a family, but it has had some wonderful moments too. January started badly when I fell down the stairs at home, resulting in the biggest, blackest bruise I have ever seen and I struggled to walk for the next week! In the middle of January, my eldest daughter’s asthma flared up badly and she had to take three months off school and was referred to hospital. It took until July for her to be completely back to normal with new inhalers and tablets. April saw my father in law taken to hospital with meningitis and he stayed there for weeks. He has recovered remarkably, considering he is 85 years old. It was a very scary time. 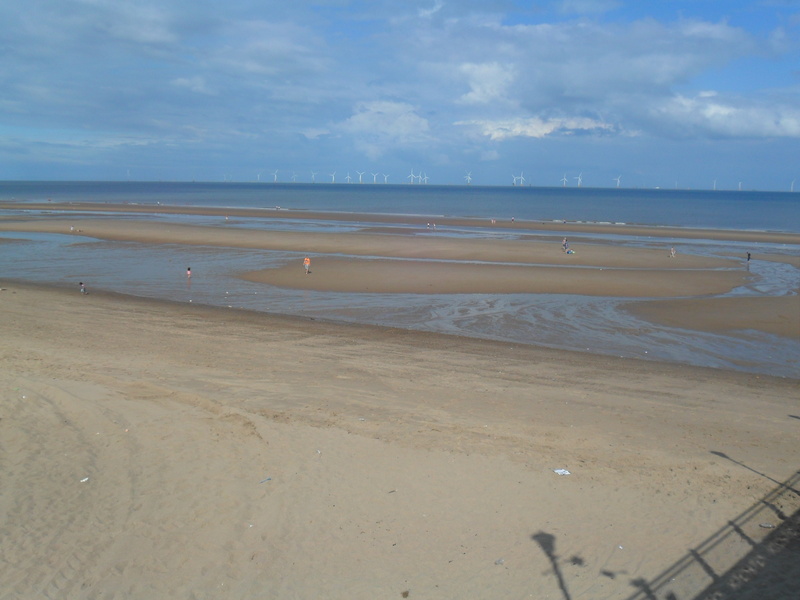 Things began to settle down at the end of June, which is when I made the decision to start my blog, thanks to Tony Wadsworth at Radio Leicester, who gave me a ‘push’ in the right direction. So if you are reading this Tony, “Thank you”. My wonderful husband set up the blog for me and taught me how to post and here I am, six months later, with just over 37,000 views…and I thought no one would want to read it! In July we went on holiday to Scarborough and then in October we went to Eastbourne. These were two lovely cheap family holidays, which we all really enjoyed. (We also had a holiday booked in February too, but sadly we had to cancel it as my daughter was too poorly to go). In October my dad collapsed and was rushed into hospital. He had cellulitis on his leg. I was very worried about him, but thankfully he only stayed for two nights, but he is still having problems with his legs now. Just before Christmas, my step father also became ill with vertigo and after various trips to the doctor, he has finally been given some tablets that seem to be working. One of my oldest friends has been fighting a brain tumour for the last three years and in January I really thought she had won the battle, but 2012 hasn’t been kind to her and now she is really poorly. I so hate to see her suffering. The highs for this year have got to be the times I have been on the radio, my blog, writing an article for my local gazette and finally having my ‘Mini Christmas Cake’ recipe appear on the ‘Love Food Hate Waste’ website. You can see the recipe here. What have I learned from 2012? Now I have written it all down, I wonder how I managed to get through this year. 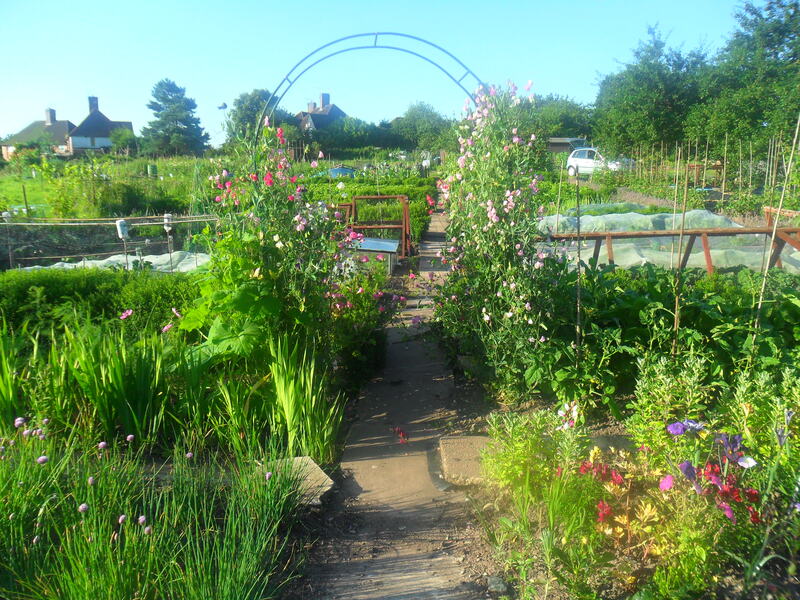 It is incredible that I managed to keep my four allotments going, on top of it all, but I did. During 2012 I have connected with lovely people from all around the world, due to my blog. I have learnt so much from all the comments written here and by reading other blogs. However, I have learnt that posting six days a week is far too much for me. I will not post quite so often during the week, but I will still always post at least once a week, but sometimes I will post more. 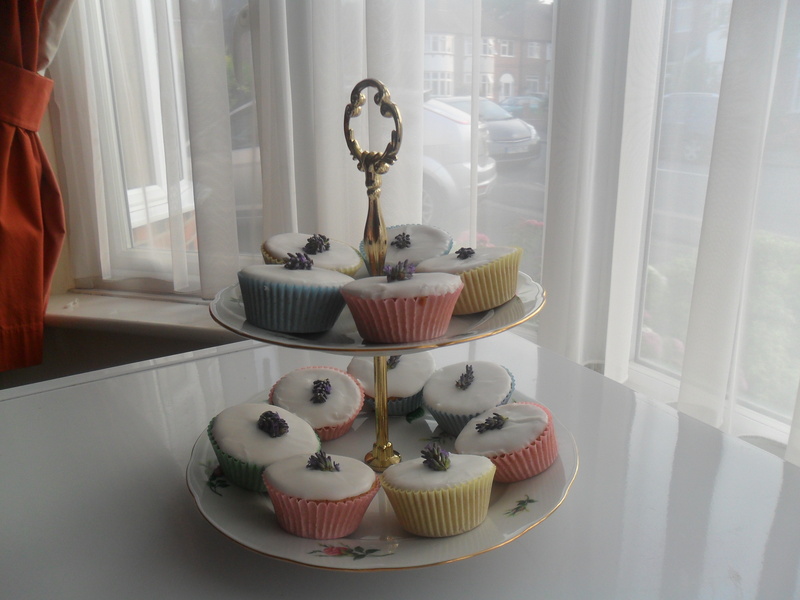 I am happy that I have a lot of recipes and information on my blog at the moment and I will keep adding to it. I want to continue to write and improve my blog, in the hope it will help someone out there to ‘live better for less’. If I can help just one person in 2013, then I will achieve my aim. Last year has taught me an awful lot, though it has had some very painful moments. I have learnt that life can be so fragile at times and how I certainly shouldn’t take anything for granted. I have also learnt who my real friends are and who I can rely on in my lowest moments too. I would love to improve the amount of ‘comments’ I get on my blog. I only get a few comments each time I post and I so love to hear from people who read my blog. So if you read my blog and a have a minute to spare, please stop and say ‘hello’. I would love to hear of how you do things and if you agree or don’t agree with what I write in my posts. If you have tried a recipe and it’s worked or you want to share a recipe that you regularly use. 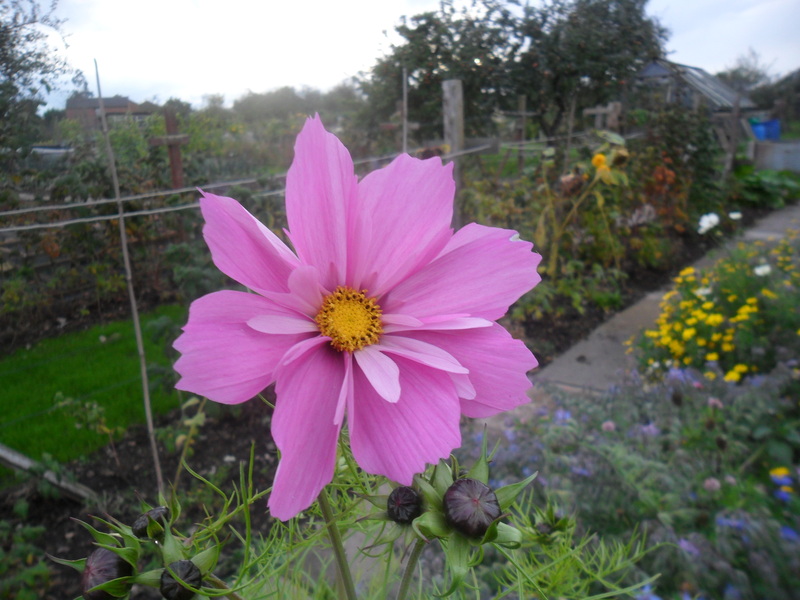 Also, if you have any questions about vegetable growing or even gardening in general, I would be glad to help. 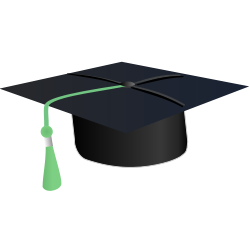 If you are unsure of how to leave a comment, please see the beginning of this post. 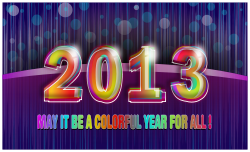 I am hoping 2013 it will be a little bit calmer for me and my family. I hope you all also have a happy and healthy year too.